Note: This version replaces the previous directive, CPL 2-2.38D which is now obsolete. This Instruction establishes policies and procedures to ensure uniform enforcement of the Hazard Communication standard (HCS). Hazard Communication, 29 CFR 1910.1200 [HCS 1994]. Hazard Communication, Final Rule, Federal Register, Vol. 77, No. 58, pgs 17574-17896, March 26, 2012 [HCS or HCS 2012]. OSHA Instruction, CPL 02-00-150, Field Operations Manual (FOM), April 22, 2011 [now obsolete; view in context: CPL 02-00-150 | current regulation: CPL02-00-159]. OSHA Instruction, CPL 02-00-124, Multi-Employer Citation Policy, December 10, 1999. OSHA Instruction, CPL 03-00-008, Combustible Dust National Emphasis Program, March 11, 2008. OSHA Instruction, CPL 02-02-038, Inspection Procedures for the Hazard Communication Standard, March 20, 1998. OSHA Instruction, CPL 02-02-039, Sample Material Safety Data Sheet, March 27, 1986. OSHA Memorandum, Enforcement Guidance for the Hazard Communication Standard's (HCS) June 1, 2015 Effective Date, February 9, 2015. OSHA Memorandum, Interim Enforcement Guidance for the Hazard Communication (HCS 2102) June 1, 2015 Effective Date, May 29, 2015. Notice of intent and equivalency required. State Plans are expected to have enforcement policies and procedures in place which are at least as effective as those in this Instruction. OSHA National, Regional and Area Offices, State Plan and State Consultation Offices. The Hazard Communication standard (HCS) has been revised to align with the United Nations Globally Harmonized System of Classification and Labelling of Chemicals (GHS Revision 3, 2009). This includes updates to the requirements for labeling and for safety data sheets (SDSs). This Instruction is designed to provide guidance to compliance safety and health officers on how to enforce the revised Hazard Communication standard during its transition period and when fully implemented. This Instruction outlines the changes in enforcement due to the release of the revised HCS published in the Federal Register on March 26, 2012. The revised standard changes "hazard determination" to the specific requirements for hazard classification of chemicals, standardizes label elements for containers of hazardous chemicals, and specifies the format and required content for SDSs. This Instruction also covers how the revised standard is enforced during its transition period and after the standard is fully implemented. Chemicals must be evaluated in accordance with specific guidance outlined in Appendices A and B of the standard. The hazard classification will result in the specification of pictograms, signal word, hazard statements, and precautionary statements which must be included on the labels. Specifications for these label elements are provided in Appendix C of the standard. The SDSs will have a standardized 16-section format (see Appendix D of the standard) and includes the information from the hazard classification (e.g., hazard class, pictogram). Protect your workers with ADA-compliant safety stations from Safety Emporium. Scope and Application, Paragraph (b). Purpose. This instruction establishes policies and provides clarifications to ensure uniform enforcement of the Hazard Communication Standard (HCS). Scope. This instruction applies OSHA-wide. Hazard Communication, Final Rule, Federal Register, Vol. 77, No. 58, pgs 17574-17896, March 26, 2012. OSHA Instruction, CPL 02-00-111, Citation Policy for Paperwork and Written Program Violations, November 27, 1995. OSHA Instruction, CSP 01-01-018, State Standards, August 31, 1984. United Nations Globally Harmonized System of Classification and Labelling of Chemicals (GHS), Revision 3, 2009.
International Agency for Research on Carcinogens (IARC) Monographs, http://monographs.iarc.fr..
National Toxicology Program's (NTP) Report on Carcinogens, http://ntp.niehs.nih.gov/pubhealth/roc/roc13/index.html, or most recent report. Centers for Disease Control and Prevention (CDC), Agency for Toxic Substances and Disease Registry (ATSDR), Toxicological Profiles. http://www.atsdr.cdc.gov/toxprofiles/index.asp. American Conference of Governmental Industrial Hygienists (ACGIH), Threshold Limit Values (TLVs®) and Biological Exposure Indices (BEIs®), http://www.acgih.org. ACGIH Documentation of the Threshold Limit Values for Chemical Substances and Physical Agents & Biological Exposure Indices, http://www.acgih.org. National Institute for Occupational Safety and Health (NIOSH), Pocket Guide to Chemical Hazards, DHHS (NIOSH) Publication No. 2005-149, http://www.cdc.gov/niosh/npg/pgintrod.html. U. S. Environmental Protection Agency, Pesticide Registration Notice 2012-1, Material Safety Data Sheets as Pesticide Labeling, http://www2.epa.gov/sites/production/files/2014-04/documents/pr2012-1.pdf. NIOSH, Registry of Toxic Effects of Chemical Substances (RTECS), http://www.cdc.gov/niosh/rtecs/default.html. NIOSH, International Chemical Safety Cards (ICSC) http://www.cdc.gov/niosh/ipcs/icstart.html. Hazardous Materials Identification System (HMIS), http://www.paint.org/programs/hmis.html, third edition. National Fire Protection Association (NFPA) 654, Standard for the Prevention of Fire and Dust Explosions from the Manufacturing, Processing, and Handling of Combustible Particulate Solids, 2013 edition. NFPA 704, Standard System for the Identification of the Hazards of Materials for Emergency Response, 2012 edition. European Agreement Concerning the International Carriage of Dangerous Goods by Road (ADR). Get your GHS-compliant labels, posters and signs from Safety Emporium. Directorate of Enforcement Programs, Office of Health Enforcement. National, Regional and Area Offices, State Plan and State Consultation Offices. State Plan Impact. This Instruction describes a Federal Program Change which establishes policies and procedures necessary for the enforcement of HCS. State Plans are required to establish enforcement policies and procedures which are at least as effective as those in this Instruction. State Plans have the option of adopting identical or different, but at least as effective, enforcement policies as those contained in this Instruction. Within 60 days of the date of issuance of this Directive, State Plans must submit a notice of intent indicating if the State Plan will adopt or already has in place inspection procedures that are identical to or different from the federal program. State adoption, either identically or different, should be accomplished within 6 months. If adopting identically, the State Plan must provide the date of adoption to OSHA, due within 60 days of adoption. If the State Plan adopts or maintains inspection procedures that differ from the federal program, the State Plan must either post its different policies on its State Plan website and provide a link to OSHA, or provide OSHA with an electronic copy and the name and contact information of someone within the State Plan who can assist the public with obtaining a copy. This action must occur within 60 days of the date of adoption. OSHA will post summary information of the State Plan responses to this Instruction on its website. Significant Changes. This Instruction outlines the changes in enforcement due to the release of the revised HCS published in the Federal Register on March 26, 2012. The revised standard changes "hazard determination" to the specific requirements for hazard classification of chemicals, standardizes label elements for containers of hazardous chemicals, and specifies the format and required content for SDSs. This Instruction also covers how the revised standard is enforced during its transition period and after the standard is fully implemented. Background. OSHA originally published the HCS in 1983 which covered manufacturing sectors only. Due to court rulings, the scope of the HCS was expanded on August 24, 1987, to cover all industry sectors. On February 9, 1994, OSHA published the final rule (59 Fed. Reg. 6126); included were minor changes and technical amendments to clarify the standard's requirements. An update to the HCS, to align it with the United Nations (UN) Globally Harmonized System of Classification and Labelling of Chemicals (GHS Revision 3, 2009), was published in the Federal Register on March 26, 2012 (hereinafter known as HCS 2012 ). The update includes new hazard classification requirements, changes in labeling requirements, and a standard format for SDSs. HCS 2012 has also helped to align OSHA with the U.S. Department of Transportation (DOT) labeling requirements. OSHA's position is that state standards can be enforced only under the auspices of an OSHA-approved State plan. Community right-to-know laws are outside the jurisdiction of OSHA and are not affected by this position. Inquiries regarding preemption that require in-depth knowledge of this subject shall be referred through the Directorate of Enforcement Programs to the Directorate of Cooperative and State Programs for response. The Agency's position regarding state standards has been described in OSHA Instruction CSP 01-01-018, State Standards. This should be consulted when answering questions regarding State standards. Effective Dates and Transition Period. Employee training must have been completed on the revised label elements and SDSs by December 1, 2013. Chemical manufacturers, importers and distributors must be in compliance with the SDS requirements by June 1, 2015. Manufacturers and importers must comply with the labeling provisions by June 1, 2015. Distributors will have until December 1, 2015, to comply with the labeling provisions unless they are relabeling the materials and/or creating SDSs. If distributors are relabeling and/or creating SDSs they must be in compliance with the labeling and SDS provisions by June 1, 2015. Your employees can stay informed and safety-ready with right to know stations and labels from Safety Emporium. [Note: All manufacturers, importers, distributors and employers must be in full compliance with HCS 2012 no later than June 1, 2015, except where noted in 1910.1200(j)(2). Where a manufacturer, importer, or distributor have exercised "reasonable diligence" and "good faith" to obtain HCS 2012-compliant SDSs from upstream suppliers but have not received them, they will be allowed limited continued use of HCS 1994-compliant MSDSs and labels. See Section X.F.2.h of this Instruction for further detail. Employers must update their written hazard communication program, any alternative workplace labeling, and provide additional employee training for newly- identified physical or health hazards no later than June 1, 2016. If a section of the HCS was updated and does not fall into any of the designated effective dates (e.g., a definition change), the change was effective as of May 25, 2012, and manufacturers, importers, distributors and employers must comply with the revised section. During the transition period before the effective dates, manufacturers, importers, distributors and employers may be in compliance with the HCS as amended in 1994 (hereinafter, HCS 1994), the HCS 2012, or both. Also during the transition period, when a violation exists either under HCS 1994 or HCS 2012, citations will be issued for both standards. See also Section X.J of this Instruction for further inspection and citation guidance related to the HCS 2012 effective dates. The specific standard sections outlined in this directive are from HCS 2012 . The procedures followed to determine if a violation is occurring are the same unless otherwise specified. A CSHO [Compliance Safety and Health Officer] citing under HCS 1994 will have to look up the specific section of HCS 1994 to cite. HCS 1994 can be found at www.osha.gov/dsg/hazcom/hazcom_1994.html. HCS 2012 is based on the GHS Revision 3 (2009). Some manufacturers, importers, distributors, or employers may want to comply with more recent or future versions of GHS issued by the UN, such as Revision 4. However, using Rev 4 or a more recent version may result in non-compliance with HCS 2012 if it contradicts or cast doubt on OSHA required information. A specific example of a major difference between Revision 3 and Revision 4 concerns aerosols. 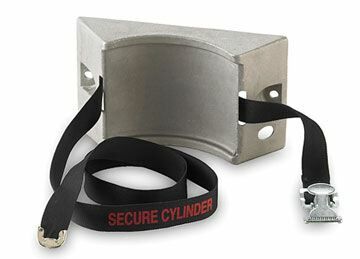 Safety Emporium has a great lineup of gas cylinder signs, storage racks, clamps and more. GHS Revision 4 changed flammable aerosols to aerosols. Revision 4 also introduced a new hazard category for aerosols: Category 3 (nonflammable). Aerosols in Category 3 do not require a pictogram and are exempt from classification as a gas under pressure. HCS 2012 does not include Category 3 Aerosols, so if an aerosol meets the criteria for a gas under pressure, it would require appropriate label elements including the gas under pressure pictogram. In this situation, a serious citation is appropriate for a Category 3 Aerosol whose label and SDSs section 2 statements are in accordance with GHS Revision 4 (i.e., missing pictogram and being exempt from classification as gas under pressure). An example of a minor change that would not result in a citation would be regarding the precautionary statement for Flammable Aerosols. HCS 2012 uses "Pressurized container: do not pierce or burn, even after use," and GHS Revision 4 states "do not pierce or burn, even after use." No citation should be issued for using the GHS Rev 4 revised precautionary statement. (Note: The GHS webpage can be found at http://www.unece.org/trans/danger/danger.html. The different versions of the GHS can be found by using the "GHS" link, then click on "GHS official text and corrigenda"). If companies are in compliance with the minimum requirements of HCS 2012 , then no citations shall be issued; if not, then citations may be issued as appropriate. If a CSHO [Compliance Safety and Health Officer] observes a label or SDSs where the precautionary statement(s), hazard statement(s), etc., appears different from the requirements of HCS 2012 , the CSHO shall determine if the information contradicts or casts doubt on OSHA required information. Precautionary statements(s), hazard statement(s) that are incorporated from the GHS must be changed to mandatory language, e.g., "should" changed to "shall." It is not compliant to have non-mandatory statements on the label. For all violations, the CSHO [Compliance Safety and Health Officer] shall document the chemical name (and hazardous ingredients) or Chemical Abstract Service (CAS) number, the frequency and duration of use, the number of employees who may be exposed, and the health and physical hazards. The CSHO [Compliance Safety and Health Officer] should include photos or video of the chemicals in question and copies of inadequate SDSs. During the transition period, when a violation exists either under HCS 1994 or HCS 2012 , citations to manufacturers or importers will be issued for both standards. Section X.J of this Instruction provides guidance on the implementation dates for each type of business-- manufacturer, importer, distributor and employer. General guidance is provided below. After the appropriate effective date, citations shall be issued only under HCS 2012 . Repeat violations and failure to abate (FTA) violations may still be issued under HCS 2012 following the citation guidance in CPL 02-00-150, Field Operations Manual (FOM), Chapter 4 [now obsolete; view in context: CPL 02-00-150 | current regulation: CPL02-00-159]. Under HCS 1994, existing labels that have been removed or defaced and not immediately marked with the required information would be a violation of 29 CFR 1910.1200(f)(8). Section 18 of the OSH Act prevents State Plans from requiring manufacturers or importers located outside of their state to have different information on their labels or SDSs than what is required by the federal HCS. However, a State Plan can have stricter requirements that it enforces on companies in that state so long as it does not unduly burden interstate commerce. Therefore, a State Plan could require more information on the labels and SDSs, but could not enforce its requirement on companies outside of the state. Before a State Plan may enforce any stricter requirements, OSHA must approve of them as a part of the state plan, in accordance with section 18 of the OSH Act. The HCS applies to any hazardous chemical present in the workplace in a manner that employees may be exposed under normal conditions of use and foreseeable emergencies. The manufacturer or importer must provide the information required by the standard on any hazardous chemicals which they manufacture or import. This information must cover the normal conditions of use and foreseeable emergencies of the product. A manufacturer or importer is out of compliance if it does not provide hazard information on a known use, or should have reasonably been expected to know may occur, even if it is not the intended use under normal conditions of use or foreseeable emergency. For example, a product forms a combustible dust when ground into a powder, and the manufacturer knows this, but the manufacturer intends its product to be melted, not ground, and it perceives that there is no hazard from combustible dust if used as intended. However, the manufacturer must still warn downstream users of the known potential hazards from combustible dust. Paragraph (b)(2). All hazardous chemicals, to which employees may be exposed under normal conditions of use or in foreseeable emergencies, are covered under the standard. Normal use does not include incidental exposure. Employees such as office workers or bank tellers who encounter chemicals only in "non-routine," isolated instances are not covered. However, an employee in a graphic arts department who "routinely" uses paints, adhesives, etc., would be covered by the HCS. By-products are covered by the HCS. A manufacturer's or importer's hazard determination or hazard classification must anticipate the full range of downstream uses of their products and account for any hazardous by-products which may be formed. For example, a manufacturer of gasoline must inform downstream users of the hazards of carbon monoxide, since carbon monoxide is a hazardous chemical and is "known to be present" as a by-product resulting from the use of gasoline. Similarly, manufacturers of diesel fuel must inform downstream users of the potential human carcinogenicity of diesel exhaust on the SDSs for diesel fuel. "Known to be present" is an important part of the HCS; it includes chemicals to which employees may be exposed during normal operations or in a foreseeable emergency. Therefore, even though an employer was not responsible for the manufacture of the hazardous chemical, the employer has the responsibility for conveying information about the hazards to its employees. For example, the standard applies in the following situations: if an employer is aware that his/her employees are exposed to chemicals brought onto a multi-employer worksite by other employer(s) or if service personnel are exposed to natural gas during furnace repair. An employer whose employees are exposed to chemicals "known to be present" must include in their hazard communication program information concerning the hazards of those chemicals. Oil and gas products; the producers are considered manufacturers under the HCS. OSHA does not consider either radiation hazards or biological hazards to be covered by the HCS. If, however, the radiological or biological agent is accompanied by an otherwise covered hazardous chemical, (e.g., a container with a biological sample packed in an organic solvent), then the container would be subject to the requirements of the HCS for the hazardous chemical only. If the laboratory ships chemicals they must meet the label and SDS requirements in (f) and (g) of the standard. Paragraph (b)(4) covers the exemptions for work operations where employees only handle chemicals in sealed containers which are not opened under normal conditions of use (such as those found in marine cargo handling, warehousing, and retail sales). Since all containers are subject to leakage and breakage, employees who work in operations where they handle only sealed containers (such as warehousing) are potentially exposed to hazardous chemicals, and, therefore, need access to information as well as training. This training is dependent upon the type of chemicals involved and must cover the potential size of any spills or leaks, the type of work performed and what actions employees are expected to take when a spill or leak occurs. Employers are required to obtain an SDS for any chemical in a sealed container if an employee requests one, and to maintain and make available to employees all SDSs received. Employers must ensure that labels on incoming containers of hazardous chemicals are not removed or defaced. The (b)(5) labeling exemptions only apply to chemicals which are subject to the labeling requirements of certain other federal agencies (e.g., cosmetics for personal use covered by the U.S. Food and Drug Administration (FDA). Paragraph (b)(5)(i) covers the labeling of pesticides as defined in the U.S. Environmental Protection Agency's Federal Insecticide, Fungicide, and Rodenticide Act (FIFRA). Because EPA exercises statutory authority over pesticides subject to FIFRA, OSHA is preempted from enforcing the labeling requirements of HCS, and also for worker training for certified applicators and agricultural workers. However, OSHA does cover all other workers such as those manufacturing pesticides. In addition, OSHA is not preempted under FIFRA from enforcing the requirement for SDSs, which applies to pesticide applicators as well as manufacturers of pesticides. EPA has issued guidance covering SDS and labeling requirements. See EPA Pesticide Registration Notice 2012-1 titled Material Safety Data Sheets as Pesticide Labeling at http://www2.epa.gov/sites/production/files/2014-04/documents/pr2012-1.pdf. Farm workers who may be exposed to pesticides not in the fields and those farm workers exposed to hazardous chemicals other than pesticides continue to be covered by the provisions of the HCS. Note: Chemicals which are used by employees at a hazardous waste site that are not hazardous waste are covered under the HCS. An example would be an acid brought on site by the employer to neutralize a waste product. Paragraph (b)(6)(iii)-(b)(6)(xii) covers other exemptions. See the HCS standard for specifics. Citations shall not be issued under the scope and application paragraphs. Citations shall be issued under the applicable paragraph of the regulation, e.g., labeling. Follow the guidelines outlined in each section of this directive. For both the article exemption (paragraph (b)(6)(v)) and items not meeting the consumer product exemption (paragraph (b)(6)(ix)), the specific hazardous chemical in the product/item must be described in the citation. Where available, include a copy of the cited product's SDS in the case file. Ensure a safe workplace with antislip floor marking signs from Safety Emporium. What is the hazardous chemical in the item to which employees were exposed? Was this item included in the employer's hazardous chemical inventory? What were the activities/operations that resulted in employee exposure to the hazardous chemical(s)? Did the release of the covered chemical(s) pose any potential physical hazard or health risk to the employees? 1910.1200(b)(6)(ix) covers the exemption for consumer products. See X.C.6 of this Instruction for the definition of a consumer product. It is the Agency's policy not to issue citations for consumer products unless the CSHO [Compliance Safety and Health Officer] can document that the product was used in the workplace in a manner not intended by the manufacturer or the frequency and duration of use results in exposures that are significantly greater than those experienced by a normal consumer. Citations may only be issued in cases where the CSHO can document that the use falls outside of the (b)(6)(ix) exemption. What is/are the hazardous chemical(s) present in the product to which employees were exposed? 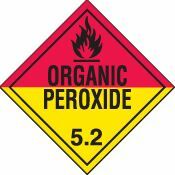 What is/are the concentration(s) of the hazardous chemical(s) present? Was the product included in the employer's hazardous chemical inventory? What is the duration of use of the product, i.e., for what period of time did the employees use the chemical during the workshift and workweek? Did it greatly exceed normal or expected use by a consumer? Was the frequency of employee use significantly greater than that of a normal consumer? A product would not be covered by HCS if a worker chooses to clean their personal work space with a product that is meant for cleaning purposes. How was the product used and in what amounts? Was the product used in the workplace for the purpose intended by the manufacturer? When available, include in the file the (M)SDS for the cited product to aid in determining coverage and intended use(s). A product may be labeled according to the consumer product exemption in subparagraph (b)(5)(v), but the usage may be covered by the HCS. In the case of mixtures, the concentration of the hazardous chemical must also be noted. For example, a citation must not simply state that a specific brand of "glue" or "dishwashing liquid" was the hazardous consumer product, or that a "brick" was the hazardous chemical in a manufactured item. The citation must state the name of the hazardous chemical (e.g., methyl ethyl ketone, sodium hydroxide, silica) and the concentration of the chemical in the mixture (e.g., 50% silica). The above instruction regarding consumer products cancels and supersedes the Agency's March 21, 1995, compliance instruction to OSHA Regional Administrators entitled, "HCS: Documentation of Citations Related to the Exposure to Hazardous Substances and Consumer Products." This document is included as Appendix A of OSHA Instruction CPL 02-00-111. This paragraph of the standard is not citable. Many new definitions have been added to the standard to reflect GHS criteria and other definitions have been changed or removed, (e.g., hazard determination is now hazard classification). Specific definitions are outlined herein for clarification and to aid in the interpretation and application of the standard. Definitions that are in italics are carried over from the HCS 1994 standard; definitions that are in bold are from the HCS 2012 standard, the appendices, or this Instruction. Where questions have arisen concerning what OSHA means by particular language, additional definitions have been provided herein for clarification. Article means a manufactured item other than a fluid or particle: (i) which is formed to a specific shape or design during manufacture; (ii) which has end-use function(s) dependent in whole or in part upon its shape or design during end-use; and (iii) which under normal conditions of use does not release more than very small quantities, e.g., minute or trace amounts of a hazardous chemical (as determined under paragraph (d) of the HCS), and does not pose a physical hazard or health risk to employees. 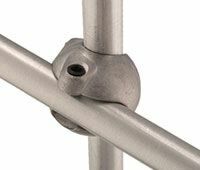 Examples of articles are stainless steel tables, vinyl upholstery, tires, and adhesive tape. 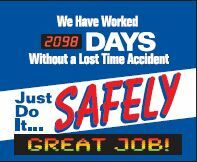 Create a culture of safety in your workplace with safety scoreboards from Safety Emporium. Articles do not include items which may release hazardous chemicals when used. This includes such things as drugs that will be crushed prior to administration, wood products that will be cut, drilled or sawed, gaskets that when deteriorated or replaced may release asbestos, metal ingots that will be melted, mercury switches that may break in use or during maintenance operations, bricks that are cut, and coated materials that are welded, cut, or ground, etc. Exposures that may occur during the destruction of the product do not change the classification of the product as an article, as long as only a trace amount of the hazardous chemical is released. In evaluating an article, one must consider the health risk which exposure to that article presents. The term "risk" as opposed to "hazard" is used here, since the hazard is an inherent property of the chemical and exists no matter the quantity of exposure. To be exempted as an article, exposure must not pose a risk to employee health. Bridging principles are methods used for classifying the hazards of mixtures that have not been tested to determine their toxicity by comparison to similar mixtures that have been tested. Each hazard class specifies which bridging principles are applicable for that class. This determination is based on data for the individual ingredients and/or similar tested mixtures. See Appendix A of the standard for additional information. Chemical means any substance, or mixture of substances. The standard's definition of "chemical" is much broader than that which is commonly used. Thus, steel coils which are cut and processed, castings which are subsequently ground or welded upon, bricks that are dry sawed or drilled, carbide blades which are sharpened, are all examples of products that contain chemicals, which, if available for exposure, are covered by the HCS. Classification means to identify the relevant data regarding the hazards of a chemical; review those data to ascertain the hazards associated with the chemical; and decide whether the chemical will be classified as hazardous according to the definition of hazardous chemical in the standard. In addition, classification for health and physical hazards includes the determination of the degree of hazard, where appropriate, by comparing the data with the criteria for health and physical hazards. Combustible dust is not defined in the HCS. The definition for combustible dust that OSHA uses is in CPL 03-00-008, Combustible Dust National Emphasis Program: a combustible particulate solid that presents a fire or deflagration hazard when suspended in air or some other oxidizing medium over a range of concentrations, regardless of particle size or shape. Additional guidance on the definition for Combustible Dust may be found at http://www.osha.gov/pls/oshaweb/owadisp.show_document?p_table=INT ERPRETATIONS&p_id=28880 and http://www.osha.gov/Publications/OSHA_3674.pdf. HCS Appendix C, C.4.30, footnote 2, states that where chemicals are not shipped in a dust form but may be used under normal conditions of use by a downstream user in such a way as to create a combustible dust hazard, the responsible party must provide labels. If the material meets the solid material exemption or the only hazard is combustible dust, the responsible party may provide labels in accordance with 1910.1200(f)(4) or may provide labels in accordance with 1910.1200(f)(1) if they so choose. This would apply to combustible dust in both solid and liquid forms. Consumer product. Paragraphs 1910.1200(b)(5)(v) and (b)(6)(ix) of the HCS provide certain limited exemptions for "consumer products" as defined in the Consumer Product Safety Act (CPSA) and "hazardous substances" as defined in the Federal Hazardous Substance Act (FHSA) when subject to labeling requirements under those statutes. OSHA looks to the Consumer Product Safety Commission law in determining whether a hazardous chemical falls within these limited exemptions. Area Offices should consult with their regional office and RSOL for interpretative assistance whenever needed. The following are general guidelines for applying these exemptions. Is for the personal use, consumption or enjoyment of a consumer in or around a permanent or temporary household or residence, a school, in recreation, or otherwise. (15 U.S.C. 2052(a)). Any substance or mixture of substances which (i) is toxic, (ii) is corrosive, (iii) is an irritant, (iv) is a strong sensitizer, (v) is flammable or combustible, or (vi) generates pressure through decomposition, heat, or other means, if such substances or mixture of substances may cause substantial personal injury or substantial illness during or as a proximate result of any customary or reasonably foreseeable handling or use, including reasonably foreseeable ingestion by children. (15 U.S.C. 1261(f)(1)(A)). However, the key to applying the limited exemptions in 1910.1200(b)(5)(v) and (b)(6)(ix) for a FHSA hazardous substance is to initially determine whether FHSA labeling requirements apply. In general, this occurs when the hazardous substance is "intended, or packaged in a form suitable, for use in the household or by children." (15 USC 1261(p)). The label for a consumer product may be exempt from the HCS labeling requirements, although the use may be covered if it is used in a manner not intended by the manufacturer or the frequency and duration of use results in exposures that are significantly greater than those experienced by a normal consumer. See X.B.4.d of this instruction (Error: that's really X.B.3.d). Container means any bag, barrel, bottle, box, can, cylinder, drum, reaction vessel, storage tank, or the like that contains a hazardous chemical. For purposes of the HCS, pipes or piping systems, engines, fuel tanks, or other operating systems in a vehicle, are not considered to be containers. In the case of fuel, the fuel producer still has an obligation to assess the hazards associated with the fuels, including their by- products. Fuel tanks or other operating systems in a vehicle do not need to be labeled in accordance with this standard as they are not considered containers. For example, liquid propane (LP) cylinders that serve as the source of fuel used to operate lift trucks, would not have to be labeled once the fuel tank is installed. Even though containers of fuel such as gasoline and LP clearly are within the scope of the HCS, no requirement exists to label those containers operating the lift truck. The spare LP cylinder(s) in storage must be labeled since they are containers. Bricks that are palletized and bound by metal bands are considered to be containers that are to be labeled. Gas cylinders (e.g., oxygen, nitrogen, acetylene) are considered containers under HCS. Distributor means a business, other than a chemical manufacturer or importer, which supplies hazardous chemicals to manufacturers, other distributors, or to employers. A company that repackages, blends, mixes, or otherwise changes the composition of a chemical is considered a chemical manufacturer under the HCS. Employees in these operations are considered to use hazardous chemicals. Under these conditions, the distributor will not be able to claim the sealed container provision in paragraph (b)(4) and will need to meet all applicable provisions of the HCS for manufacturers. Paragraph (g)(7) distinguishes between a "distributor" and a "retail distributor." This distinction has been made to recognize that retail establishments primarily deal with the general public. Retail distributors that sell to both employers and the general public only need to provide an SDS (or MSDS) upon request. Wholesaler distributors that sell to employers over-the-counter must provide a SDS to such employers upon request, and shall post a sign or otherwise inform them that a SDS is available. Protect your workplace with portable and stationary eye washes and accessories from Safety Emporium. Scrap dealers are generally considered distributors and, to the extent that their products are not articles, they would NOT be exempt from the HCS. If the company (supplier) providing the goods to the scrap dealer is furnishing articles which the supplier did not manufacture (such as a broken refrigerator), the supplier is not required to provide a label or SDS. However, if a supplier sent a product that contained hazardous chemicals, as would be the case if a company scraps pipes containing a hazardous chemical or its residue, that could be released in more than small or trace quantities, present a physical hazard, or present a health risk, then the item is not an article. The supplier must provide a label and SDSs to the scrap dealer. Similarly, manufacturers are also required to pass on any information (labels and SDSs) they have regarding known contaminants of the scrap, as would be the case if cutting fluids were present. In addition, article manufacturers that sell for scrap those produced items that fail specification or suppliers who provide, for example, metal tailings from a manufacturing process, must develop and transmit SDSs and labels to downstream scrap dealers. Generally, non-manufacturing scrap dealers may comply with the duty to provide labels and safety data sheets for the scrap they sell by sending their downstream users the labels and SDSs the dealer received from employers who have scrapped the materials. Foreseeable emergency means any reasonably anticipated occurrence in the workplace use of the chemical such as, but not limited to, equipment failure, rupture of containers, or failure of control equipment which could result in an uncontrolled release of a hazardous chemical into the workplace. Employee exposures in the event of an accidental fire are not considered a foreseeable emergency. Hazard category means the division of criteria within each hazard class, e.g., oral acute toxicity and flammable liquids include four hazard categories. These categories compare hazard severity within a hazard class and should not be taken as a comparison of hazard categories more generally. Hazard class means the nature of the physical or health hazards, e.g., flammable solid, carcinogen, oral acute toxicity. Hazard not otherwise classified (HNOC) means an adverse physical or health effect identified through evaluation of scientific evidence during the classification process that does not meet the specified criteria for the physical and health hazard classes addressed in the standard. For example, an HNOC is polymerization that may release heat. Polymerization is a chemical reaction in which a large number of relatively simple molecules combine to form a chain-like macromolecule. The combining units are called monomers (e.g., methyl methacrylate), the product is a polymer (e.g., polymethyl methacrylate). This does not extend coverage to adverse physical and health effects for which there is a hazard class addressed in the standard, but the effect either falls below the cut-off value/concentration limit of the hazard class or is under a GHS hazard category that has not been adopted by OSHA (e.g., acute toxicity Category 5, skin corrosion/irritation Category 3, or aspiration Category 2). An adverse physical or health effect is a material impairment of health or functional capacity, as that phrase is used in section 6(b)(5) of the OSH Act, 29 U.S.C. § 655(b)(5), resulting from workplace exposure to a chemical. A health effect is determined in accordance with the weight-of- evidence criteria in Appendix A of the standard, paragraph A.0.3. The term physical effect generally refers to a material impairment of health or functional capacity caused by the intrinsic hazard(s) of a particular chemical in normal conditions of use or foreseeable emergencies. Scalds caused by exposure to chemicals at high temperatures, or slips and falls caused by treading on a solid chemical shaped in a rounded form or spilled liquids, are not covered physical effects under the HNOC definition. For example, water is not classified as an HNOC merely because an employee might be scalded by contact with boiling water or because an employee might contract hypothermia by being immersed in cold water for a long period of time. Similarly, water is not classified as an HNOC by virtue of the fact that an employee might be injured when slipping and falling on a wet surface or when sprayed by water at high pressure. The foregoing examples of adverse physical effects that are outside the scope of HNOCs are designed to assist in better understanding the concept of HNOCs. They are not intended to be exhaustive or limited to chemicals, such as water, which are not hazardous chemicals. NOTE: OSHA's definition above for HNOC ensures that hazards previously covered under HCS 1994 remain covered under HCS 2012. Hazard statement means a statement assigned to a hazard class and category that describes the nature of the hazard(s) of a chemical, including, where appropriate, the degree of hazard. See Section X.F.2.c of this Instruction for the discussion on hazard statements. Hazardous chemical means any chemical that is classified as a physical hazard or a health hazard, a simple asphyxiant, combustible dust, pyrophoric gas, or hazard not otherwise classified. Store your solvents safely with flammable storage safety cabinets from Safety Emporium. Importer means the first business with employees within the Customs Territory of the United States which receives hazardous chemicals produced in other countries for the purpose of supplying them to distributors or employers within the United States. When chemicals are imported into the United States, the person (meaning one or more individuals, partnerships, associations, corporations, business trusts, legal representatives, or any organized group of persons) who imported the product automatically becomes the responsible party. OSHA only has jurisdiction over transactions which affect commerce within the United States. As the importer is the first point of contact within this country, the importer is therefore the responsible party for complying with the HCS, and must include their name and address on the SDS and label. Preferably the original foreign manufacturer's name and address are removed to prevent confusion. The importer is responsible for the information and for providing any updates to the labels and SDSs in all cases. An employer who brings hazardous chemicals into the country for use in their own workplace, becomes an importer and is, therefore, responsible for conducting a hazard classification of the chemical, producing the SDS, ensuring appropriate labeling, and all other applicable provisions of the standard. Label means an appropriate group of written, printed or graphic information elements concerning a hazardous chemical that is affixed to, printed on, or attached to the immediate container of a hazardous chemical, or to the outside packaging. However, (f)(1) requires the label on each container and, therefore, labeling only the outside package is not compliant. Manufacturers means an employer that manufactures, processes, formulates, or repackages a hazardous chemical. The first employer meeting the definition of a manufacturer will be responsible for performing the hazard classification, developing or obtaining the SDSs, and labeling containers of the hazardous chemicals. Manufacturers include those companies which repackage, blend or mix chemicals. If a downstream employer meeting the definition of a manufacturer alters a product (e.g., chemically react) and/or removes the original manufacturer's name and/or contact information, then the downstream user becomes the responsible party for the product and needs to consider all the known or intended uses of the product. The first employer meeting the definition of a manufacturer does not need to consider uses of a chemically reacted version of their product. An example of this is a company providing methyl methacrylate to a second manufacturer who creates polymethyl methacrylate and then makes products from the polymethyl methacrylate; the first manufacturer does not need to warn on the hazards of the products made from the polymethyl methacrylate. Oil and gas producers are chemical manufacturers because they process hazardous chemicals for use or distribution. Sawmills are considered to be manufacturers since they are the first employers who process the product. A sawmill processes timber into lumber, thereby creating wood dust, which is a hazardous chemical under the HCS. Operators of grain elevators also meet the definition of a manufacturer. Produce means to manufacture, process, formulate, blend, extract, generate, emit or repackage. This includes the extraction of naturally occurring substances, such as clay and stone which contain crystalline silica. Responsible party means someone who can provide additional information on the hazardous chemical and appropriate emergency procedures, if necessary. This could be the manufacturer or importer or a company contracted to provide more information. The name and address of the responsible party MUST be the same on the SDS and the label. Keep your workplace safe with Spill prevention devices, containers and signage from Safety Emporium. 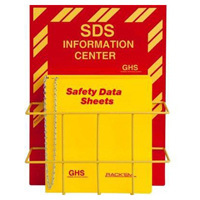 Safety data sheet (SDS) means written or printed material concerning a hazardous chemical that is prepared in accordance with paragraph (g) of the HCS standard. Shipped container means any container leaving the workplace, whether through normal shipping routes or physically handed to another person. Simple asphyxiant means a substance or mixture that displaces oxygen in the ambient atmosphere, and can thus cause oxygen deprivation in those who are exposed, leading to unconsciousness and/or death. Examples of a simple asphyxiant are nitrogen, helium, argon, neon, and methane. Specific target organ toxicity-single exposure (STOT-SE) means specific, non-lethal target organ toxicity arising from a single exposure to a chemical. Specific target organ toxicity-repeated exposure (STOT-RE) means specific target organ toxicity arising from repeated exposure to a substance or mixture. Stationary process container means a container that is not mobile, in which a process other than storage takes place, or a stationary container which contains a liquid (other than water) used for dipping and coating. Examples of stationary process containers are permanent dip tanks, and permanent mixing vessels. Items which are not stationary process containers are storage tanks (even if connected to a distribution system), and portable dip tanks. This definition applies only to the Hazard Communication standard. It does not change the scope or coverage of any other OSHA standard (e.g., 1910.119 - Process Safety Management of Highly Hazardous Chemicals). It is only applicable to the labeling requirements of the HCS. Use means to package, handle, react, emit, extract, generate as a byproduct or transfer. Weight of evidence means that all scientific data bearing on the classification of a chemical shall be considered together, including the results of valid in vitro tests, relevant animal data, and human experience such as epidemiological and clinical studies, and well-documented case reports and observations. See Appendix A, Chapter A.0.3 of the standard for a further discussion on how to use the weight of evidence for classification. This section outlines the classification of chemicals under the revised standard. DSG and DTSEM (SLTC) are available to assist [Compliance Safety and Health Officers] in the review of a manufacturer's or importer's classification scheme, if necessary. OSHA does not classify nor approve of classifications of chemicals for manufacturers, importers and distributors. If OSHA is asked for assistance, the manufacturer, importer or distributor shall be directed to the appropriate sections of this Instruction's appendices. Chemical manufacturers and importers are required to classify the hazards of the chemicals they produce or import. If an employer choses to do its own classifications, it is responsible for complying with the classification requirements of the HCS. Hazard classification must follow the requirements outlined in Appendices A and B of the standard. A listing of the sections in Appendices A and B of the standard can be found in Appendix A of this Instruction. Deviations from the Appendices A and B of the standard (e.g., using split entry) are not in compliance with the HCS. See April 2, 2013 letter of interpretation to Brian Karlovich on split entry at http://www.osha.gov/pls/oshaweb/owadisp.show_document?p_table=INTERPRETATIONS&p_id=29039. The classification of hazards is to be performed based on the criteria provided for each individual hazard class. Manufacturers or importers who are evaluating the hazards of the chemicals must consider all available data on the hazards. See OSHA memo, Classification of Combustible Dusts under the Revised Hazard Communication Standard, at http://www.osha.gov/pls/oshaweb/owadisp.show_document?p_table=INTERPRETATIONS&p_id=28880. The quality and consistency of the data shall be considered. Information on chemicals related to the material being classified shall be considered as appropriate, as well as site of action and mechanism or mode of action study results. Both positive and negative results shall be considered together in a single weight-of-evidence determination. Positive studies which are consistent with the criteria for classification will normally justify classification. See Appendix A of the standard, chapter A.0.3.3. The specific bridging principles that can be used for each classification are found in the appropriate sections of Appendices A of the standard. 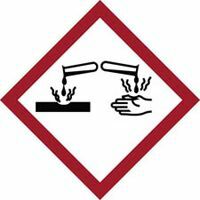 Appendix B of this Instruction provides compliance guidance on evaluating the classification of chemicals. There is no requirement for testing to determine the classification; however, the manufacturer or importer may test if so desired. While the HCS does not require testing of chemicals to determine their individual hazards, such testing is allowed and some preparers of SDSs may choose to do so. If a chemical manufacturer chooses to test a mixture as a whole, the chemical manufacture may perform the full range of tests, including tests to determine health risks and physical hazards, or test certain properties of a chemical and rely on the literature for others. Known intermediates and by-products are covered by the HCS and must be addressed in the hazard classification. Decomposition products which are produced during normal conditions of use or in foreseeable emergencies for the product (e.g., plastics which are injection molded, diesel fuel emissions) are covered. Get your safety reference books at Safety Emporium. The mandatory criteria for classification of a chemical for carcinogenicity under HCS 2012 are found in Appendix A, chapter A.6 of the standard. Unless OSHA has determined that the chemical is a carcinogen, these classifications are to be based on all existing data, such as internal documents, peer-reviewed published studies, and additional data accepted by other agencies, e.g., National Institute for Occupational Safety and Health (NIOSH) evaluations. Those chemicals that OSHA has determined in Subpart Z to be carcinogenic shall be addressed appropriately as carcinogens on labels and SDSs. The National Toxicology Program's (NTP) Report on Carcinogens, or the International Agency for Research on Carcinogens (IARC) monographs may be used instead of the manufacturer or importer performing their own weight-of-evidence classification. These sources shall be treated as providing information to be used in the weight-of-evidence decisions that are appropriate under the GHS-aligned criteria. Use the information provided in Appendix F of the standard when checking the classification of carcinogens. Please see Appendix C of this Instruction for more information on evaluation of carcinogenicity. As discussed below, classification of mixtures has a specific order of precedence; however, it does not apply to Carcinogenicity, Germ Cell Mutagenicity and Reproductive Toxicity (see Appendix A of the standard, chapter A.0, subparagraph A.0.4.2 and chapter A.6, for Carcinogenicity). The HCS 2012 classification approach does not have one single cut-off value for classification. Each physical or health hazard has its own specified cut-off values for each specific category. See Appendices A and B of the standard for each specific cut-off value. A partial list of cut-off values can be found in Appendix B of this Instruction. Under the HCS 1994, a product, if not tested as a whole, that contained 1% of a hazardous component and 99% of a nonhazardous ingredient, was assumed to present the same hazard as the component. This may not be the case under HCS 2012. To classify the hazards of a mixture, the manufacturer or importer must use the information contained in Appendices A and B of the standard. This may possibly result in the chemical having a different classification than was previously identified under HCS 1994. Ingredients/components are present at or above the cut-offs. Ingredients/components are present below the cut-off value but still present a health risk at the lower level, e.g., isocyanates that are below the cut-off limit but can cause sensitization at the lower concentration. Also, where a component present below the cut-off may be released above an OSHA permissible exposure limit (PEL) or American Conference of Governmental Industrial Hygienists (ACGIH) Threshold Limit Value (TLV®). An employer may rely upon the hazard classification performed by the chemical manufacturer. Manufacturers and importers must classify and create SDSs and labels for intermediates that are formed in a discrete step in the process of making the final product. This ensures that the employees are protected and the information is available in the case of an emergency. The manufacturer or importer must classify with the available information. For example, in the process of creating chemical E that is formed in two steps, A + B = C and C + D = E, the creation of C is a discrete stopping point and can be isolated. Therefore, OSHA would require the creation of an SDS for C as well as the SDS for E.
Manufacturers and importers are not required to classify, label, or create SDSs for intermediates that cannot be isolated as discrete entities from the reactant materials. In other words, classification is required for intermediates created in transition that have not completely reacted and do not form a discrete product. An example of this would be A+B makes C which continues to react with B to form D. If C cannot be isolated, then OSHA would not require an SDS. Whoever performs the classification is responsible for the accuracy of the information. The evaluation must assess the hazards associated with the chemicals including hazards related to any anticipated or known use or foreseeable emergency which may result in worker exposure. Usually, the chemical manufacturer possesses knowledge of hazardous intermediates, by-products, and decomposition products that can be emitted by their product. Specific Target Organ Toxicity (STOT) - Single Exposure (SE)/Repeated Exposure (RE) classification. Mixtures containing from 1% to less than 10% of Category 1 STOT-SE ingredients may be classified as Category 2 STOT-SE under the following limited circumstances. A.8.3.1 of the standard allows for the classification of mixtures under the criteria as used for substances. Where the classification of the ingredients is based on animal data only (see A.8.2.1.6 of the standard), the use of the guidance values in Table A.8.1 of the standard is appropriate as a part of the total weight-of-evidence approach. It may be appropriate, in light of the guidance values, to classify a mixture containing from 1% to less than 10% of Category 1 STOT-SE substances as a Category 2 STOT-SE hazard, where warranted by the weight of evidence. Such a classification must be consistent with all of the criteria in A.8.2.1 ("Substances of Category 1 and Category 2") of the standard, including consideration of the severity of the effect observed. However, a mixture containing 1% or more of a STOT ingredient must be classified as a STOT hazard when classification is based solely on the application of the guidance value and the dose concentration in the mixture. Mixtures containing from 1% to less than 10% of Category 1 STOT-RE ingredients may be classified as Category 2 STOT-RE under the following limited circumstances. A.9.3.1 of the standard allows for the classification of mixtures under the criteria used for substances. Where the classification of the ingredients is based on animal data only (see A.9.2.6 of the standard) the use of the guidance values in Tables A.9.1 and A.9.2 of the standard is appropriate as a part of the total weight-of-evidence approach. It may be appropriate, in light of the guidance values, to classify a mixture containing from 1% to less than 10% of Category 1 STOT-RE substances as a Category 2 STOT-RE hazard, where warranted by the weight of evidence. Such a classification must be consistent with all of the criteria in A.9.2 ("Classification Criteria for Substances"), including consideration of the severity of the effect observed. However, a mixture containing 1% or more of a STOT ingredient must be classified as a STOT hazard when classification is based solely on the application of the guidance value and the dose concentration in the mixture. Petroleum streams have unique classification issues. The classification of petroleum streams is outlined in Appendix D of this Instruction. More information on the classification requirements can be found in Appendices B, C, and D of this Instruction, and also in Appendices A and B of the standard. The adequacy of a company's hazard classification should be assessed primarily by examining the outcome of that classification, i.e., the accuracy and adequacy of the information on labels and SDSs and, if available, by reviewing the manufacturer's or importer's hazard classification procedures and calculations. The hazard classification must include an assessment of all hazards. The chemical manufacturer or importer must consider the potential exposures that may occur when downstream employers use the product, and identify the hazards that may result from that use on the label and/or SDS prepared for the product. In the event there are questions concerning the adequacy of the scientific data underlying a chemical manufacturer's hazard classification the CSHO [Compliance Safety and Health Officer] shall collect the information from the studies the manufacturer used to classify the chemical(s), and the rationale the manufacturer or importer used to determine the classification. The Area Director should then contact the regional hazard communication coordinator, who then may refer those findings to the Directorate of Standards and Guidance (DSG) or the OSHA's Salt Lake Technical Center (SLTC) for review, as necessary. If the chemical manufacturer or importer has not classified the chemicals produced or imported, (d)(1) shall be cited. If the chemical manufacturer or importer has not considered the full range of scientific literature, e.g., ignoring the studies that do not support their conclusions (such as not including a study showing reproductive toxicity while including five other studies that do not show reproductive toxicity), (d)(2) shall be cited. NOTE: The evidence to support this citation shall be gathered as outlined in X.D.2.c above. While performing inspections of manufacturers the CSHOs [Compliance Safety and Health Officers] shall review labels and SDSs. If discrepancies are noted or questions concerning the classification arise, the CSHOs should contact the regional hazard communication coordinator who will determine if DSG or the SLTC should be contacted. If the chemical manufacturer or importer has not properly utilized Appendices A and B of the standard to classify the hazards of mixtures, (d)(3)(i) shall be cited. When classifying mixtures, a chemical manufacturer or importer may rely on the information provided on the SDSs for individual ingredients. However, if the chemical manufacturer or importer knows, or by exercising reasonable diligence should have known, that the information provided on the SDS for those individual ingredients was misstated or omitted, and relied on this information, (d)(3)(ii) shall be cited. Where a manufacturer or importer has not adequately classified the chemical or mixture, grouped citations for (d)(1) and (d)(2) (and (d)(3) if for a mixture) shall be considered. In general, citations for hazard classifications should be cited as serious. Written Hazard Communication Program, Paragraph (e). In most cases, enforcement for the written program should not be affected by the implementation dates of the revisions to the standard. All employers with employees who are or are potentially exposed to hazardous chemicals known to be present in their workplaces, must develop, implement, and maintain at each workplace a written hazard communication program that includes labeling and other forms of warning (f), safety data sheets (g), and training (h). Programs must be developed whether the employer generates the hazard or the hazard is generated by other employers. Get your Tyvek protective clothing from Safety Emporium. On a multi-employer worksite, the CSHOs [Compliance Safety and Health Officers] should refer to enforcement policies for multi-employer worksites in the FOM and CPL 02-00-124, Multi-Employer Citation Policy. The HCS obligates all employers, including those on multi- employer worksites, who may expose their employees or employees of other employers (e.g., temporary workers and contractors) to hazardous chemicals to develop a written program. An employer on a multi-employer worksite must include the methods they will use in their program to provide other employers with on-site access to SDSs. This covers each hazardous chemical to which the other employers' employees may be exposed. Therefore, one employer does not have to physically give the other employer the SDSs but rather must inform others of the location where the SDSs will be maintained. (e.g., in the general contractor's trailer). The HCS allows employers to decide on the method of information exchange. HCS does not specify how the program is to be maintained, but it does specify that employees must have access to the written hazard communication program. Therefore, the employer may maintain the program either on paper or in electronic format, as long as the program meets all other requirements of the standard. The employer must ensure that employees know how to access the document and that there are no barriers to employees' access (e.g., storage in a locked room). Inspection Guidelines for the Written HCS Program. The inventory must have a product identifier for each chemical known to be present that aligns with the SDS and label. The inventory can be for the entire facility or for individual work areas. 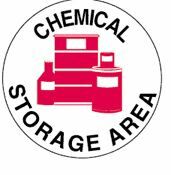 The inventory must include all chemicals present (even if the chemicals are stored/not in use). The program must cover the methods the employer will use to inform employees of the hazards in non-routine tasks, and the hazards associated with chemicals contained in unlabeled pipes in their work areas. Method(s) to provide the other employers on-site access to SDSs for each hazardous chemical the other employer(s)' employees may be exposed, (e)(2)(i). Method(s) to inform other employers about any necessary precautionary measures to protect employees, (e)(2)(ii). How to inform other employer(s) about the labeling system used, (e)(2)(iii). Availability of the Program to Employees, Employee Representatives, NIOSH, and OSHA Representatives Upon Request, (e)(4). 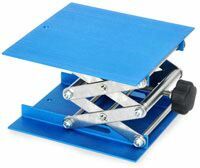 Get a grip on your experiments with laboratory clamps and accessories from Safety Emporium. Designation of the person(s) responsible for labeling on shipped containers. Designation of the person(s) responsible for workplace labeling. Description of labeling system(s) used. Description of alternative to labeling for workplace containers, where applicable. Procedures to review and update label information when necessary (for employer's workplace labeling and for shipped container labels). Designation of the person(s) responsible for obtaining/maintaining the SDSs. How the data sheets are to be maintained (e.g., in notebooks in the work area(s), in a pick-up truck at the jobsite, via telefax), procedures on how to retrieve SDSs electronically, including back- up systems to be used in the event of failure of the electronic equipment, and how employees obtain access to the SDSs. Procedure to follow if the SDS is not received at the time of the first shipment. Procedure to follow if it is suspected that the SDS is not appropriate (e.g., missing hazards). Procedure to follow to determine if the SDS is current. For chemical manufacturers or importers, procedures for updating the SDS when new and significant health information are found. Designation of the person responsible for conducting the training. How the training is to be conducted (e.g., written, visual presentation using slides, verbal). The required elements of the training program. The program must address the duties in (h)(1) through (h)(3). Procedure to train new employees at the time of their initial assignment and to train employees when a new hazard is introduced into the workplace. Procedure to train employees when they are potentially exposed to chemicals used by other employers, multi-employer worksites. When evaluating an employer's hazard communication program the CSHO [Compliance Safety and Health Officer] must determine if the employer has fulfilled all of the requirements of the program but has not put it in writing, has no program and has not implemented specific parts of the HCS, or has an inadequate written program. Generally, all violations of paragraph (e) shall be grouped with the violated element(s) listed in the subparagraphs of (e) and/or violations of paragraphs (f), (g), and (h) as appropriate, since (e)(1) is the only provision under paragraph (e) which addresses the development, implementation and maintenance of the written hazard communication program. If an employer has done nothing to comply with the HCS, citations for violations of paragraphs (e), (f), (g), and (h) of the standard may be issued as separate items, with separate penalties. Normally these employers will be cited for violations of (e)(1), (f)(1), (g)(1) and (h)(2) & (3). Where employees are exposed or potentially exposed to a hazardous chemical, and labeling, SDS, chemical inventory, and training requirements are met, but there is no written program, a citation for (e)(1) should not be issued, as it is considered a de minimis violation. See X.E.5.d. If an employer has not developed a written hazard communication program and has not implemented the other parts of the HCS, a citation shall be issued for (e)(1) and grouped with the section(s) of the standard that the employer is not complying with, e.g., not maintaining MSDS/SDS, (g)(8). If the employer has developed a written hazard communication program but the program does not cover all the required elements or is deficient in one or more element(s), that specific element(s) shall be cited, e.g., (e)(1)(i) when the employer has not developed a chemical inventory. Employers in multi-employer worksites must include information in their program concerning SDS access, precautionary measures and in-house labeling. Ensure safety in your workplace with laboratory labels and signs from Safety Emporium. Employers on such sites who do not use hazardous chemicals, but whose employees are exposed to the chemicals used by other employers, are required to have a program and train their employees on the hazards of the chemicals in the work areas. If an employer fails to comply with this, CSHOs [Compliance Safety and Health Officers] shall cite paragraphs (e)(1) and appropriate sections of (h), Training. A citation for (e)(2)(i) shall be issued if an employer fails to include the methods by which the employer will inform other employers about on-site access to SDSs. A citation for (e)(2)(ii) shall be issued if an employer fails to include the methods for informing other employers about precautionary measures needed. A citation for (e)(2)(iii) shall be issued if an employer fails to include the methods by which the employer will inform other employers about the workplace labeling system used. The employer is required to provide the written program to employees, their designated representatives, the Assistant Secretary for OSHA, and the Director of NIOSH upon their request, in accordance with 1910.1020, Access to Employee Exposure and Medical Records. This requirement means that the employer must provide a copy of the written program within the time periods discussed in 1910.1020 (i.e., no later than 15 working days after the request for access is made). If the employer does not comply, citations may be issued for (e)(4). All citations related to an employer's HCS written program should be cited in accordance with CPL 02-00-111, Citation Policy for Paperwork and Written Program Violations, Section G.5. Citations shall generally be issued as serious unless otherwise noted. Manufacturer and importers must comply with the labeling provisions by June 1, 2015. Distributors will have until December 1, 2015, to comply with the labeling provisions unless they are relabeling the materials. If a distributor is relabeling and replaces the manufacturers or importers name with their name, the distributor must be in compliance with the labeling provisions by June 1, 2015, as they become the responsible party. During the classification process, the manufacturer, or importer, or distributor will determine the appropriate classification and category of a product. This will result in the required elements: precautionary statements, hazard statements, pictograms and the signal word ("Danger" or "Warning"), to be placed on the label. A few classifications do not result in the use of a signal word. All the label elements for each hazard class can be found in Appendix C of the standard. All labels must be in English, however they can be provided in other languages as well. The manufacturer, importer or responsible party name on the label must be the same as on the SDS. Lighten things up with witty workplace labels and signs from Safety Emporium. OSHA does not specify the format of the label, just the minimum information required on the label. A manufacturer, importer or distributor may add supplemental information to a label, as long as it does not lead to unnecessarily wide variation or undermine the required information. Supplemental information need not be physically separated from the required information on the label; however, paragraph C.3.2 of Appendix C of the HCS 2012 provides that the placement of supplemental information must not impede identification of the information required by HCS 2012. Quality control samples taken in a plant must be labeled, tagged, or marked unless the person taking the sample is also going to be performing the analysis, and thus the sample would come under the portable container exemption under paragraph (f)(8). A hand- written label may be utilized as long as the required label information is present. This may be done under paragraph (f)(1) or (f)(6) depending on the circumstance. Labels must be prominently displayed and in English. Labels must be legible without the use of any aid (except corrective lenses if the person reading the label normally has to wear glasses). Therefore, if the label is not legible, the label is out of compliance with (f)(2) (for manufacturer/importer labels) or (f)(10) (for workplace labels). A hazard not otherwise classified (HNOC) is not required to be noted on the label but may be included as supplementary hazard information. The manufacturer, importer, or distributor can also choose to list the environmental effects and use the environmental pictogram on the label, if applicable, so long as the additional information does not impede the required information. OSHA does not approve or endorse labels. The use of wording such as "OSHA certified/approved/compliant" on a HCS label is prohibited. For additional guidance, see OSHA Brief titled: Hazard Communication Standard: Labels and Pictograms, at http://www.osha.gov/Publications/OSHA3636.pdf. Product identifier (this must correlate to the SDS), (f)(1)(i). Signal word, i.e., Danger or Warning, (f)(1)(ii). "Danger" and "Warning" are the only signal words allowed. The use of any other signal-type word is not in compliance with paragraph (f)(1)(ii). Only one signal word is allowed on the label, see Appendix C, C.2.1.1 of the standard. If the chemical manufacturer or importer can document that all or part of the hazard statement is not appropriate then the manufacturer or importer may omit that portion or that statement. See Appendix C, C.2.2.2 of the standard. The manufacturer or importer may combine hazard statements to save space and improve readability so long as all the required hazard information is conveyed. See Appendix C, C.2.2.2 of the standard. A list of the pictograms is in Appendix F of this Instruction. Pictograms on shipped containers must have a white background with a red border. The size of the pictogram must be "sufficiently wide to be clearly visible." See Appendix C, C.2.3.1 of the standard. Labels may not contain blank diamonds (red borders with no symbol). Blacked out pictogram borders are compliant with the requirements of HCS 2012 as they are not a "square red frame set at a point without a hazard symbol." However, if a blank red frame is not fully covered or filled in, the label would not be in compliance. A particular pictogram may only appear on a label once, even if multiple classifications use the same pictogram and the product's classification would result in the same pictogram for multiple hazards. See Appendix C, C.4 of the standard. For example, if a chemical is classified as a STOT Category 1 and the chemical is also toxic to reproduction, the health hazard pictogram shall appear only once. Where a product label was to have multiple, identical, HCS pictograms, a user might incorrectly assume that the product is more hazardous than another product that is labeled with one pictogram; therefore, multiple, identical, HCS pictograms are not in compliance with the HCS. Precautionary statements are required to be written out. It is not adequate to reference the GHS precautionary statement number. The precautionary statements for each hazard category are listed in Appendix C of the standard. With a few exceptions, all precautionary statements must be included on the label (Note: the European CLP (classification, labelling and packaging regulation) allows no more than six precautionary statements). Where a chemical is classified for a number of hazards, and the precautionary statements are similar, the most stringent must be included on the label. See Appendix C, C.2.4.7 of the standard. In some cases, the precautionary statement is not appropriate for the hazard, and following the precautionary statement will result in an increased hazard (e.g., treat someone who has a water-reactive chemical on them by wrapping the area in wet bandages). If the labeler has omitted a precautionary statement on the grounds that it is not appropriate, the labeler must be able to provide adequate information supporting its claim. If the supporting claim is adequate, no citation shall be issued for the omission. In some cases, the precautionary statement for health hazards, "store locked up," may not be appropriate for a particular chemical. If the labeler can document that a chemical will never present the hazard during storage, but only during use or processing, this precautionary statement may be omitted. If a downstream user has a question about the presence or absence of a precautionary statement, the user should contact the manufacturer or importer or responsible party for further information. It is not acceptable for a manufacturer, importer or responsible party to omit a precautionary statement without data or based only on anecdotal evidence. The precautionary statements can be arranged by the manufacturer, importer or distributor to create an order of preference; however, all precautionary statements must be listed except as otherwise provided in Appendix C, C.2.4.5, C.2.4.6 and C.2.4.8 of the standard. Precautionary statements may be combined to save space and improve readability. See Appendix C, C.2.4.6 of the standard. In Appendix C of the standard, the precautionary statements are broken out into, "Prevention", "Response", "Storage" and "Disposal," and listed in four columns. All four types/columns listed are precautionary statements and all must be included on the label (with the exceptions listed above). Make your PPE readily available with safety dispensers from Safety Emporium. In Appendix C of the standard three full stops symbol "..." on precautionary statements is to indicate that all applicable conditions are not listed, and the classifier is to fill in the appropriate information, e.g., the route of exposure. The backslash or diagonal symbol "/" is used in Appendix C of the standard to indicate that the classifier is to choose one of the precautionary statement options, e.g., "wear protective clothing/eye protection" could be either "wear protective clothing" or "wear eye protection" or "wear eye protection and protective clothing." The square bracket symbol "[ ]", in Appendix C of the standard, indicates a section of a precautionary statement that may not be appropriate for all situations and the classifier must choose whether it is appropriate. Name, address and telephone number of the chemical manufacturer, importer, or other responsible party, paragraph (f)(1)(vi). The phone number listed must be reachable, and the person answering the phone must be able to respond to questions in English. The phone number does not have to be a 24-hour emergency number. The address must either be the mailing address (P.O. Box may be used) or the physical location of the company. A web address may not be used in place of a physical or mailing address but may be included as supplemental information. The company name and address must be the same as that on the SDS. May be included on the label as long as it does not cast doubt or contradict the validity of the label information required by HCS 2012 or impede the user's ability to identify the information required by HCS 2012. Therefore, any information, such as the Hazardous Materials Identification System (HMIS) or NFPA, can be included as long as it does not cast doubt or contradict the validity of the label information. Policy on limited continued use of HCS 1994-compliant labels. Scale up your procedures with Soxhlet extractors from Safety Emporium. Where a manufacturer or importer has not received classification information from its upstream supplier(s) on which it intends to rely for the classification of its product before June 1, 2015, the manufacturer or importer may continue to use the HCS 1994 label under certain limited circumstances. To do so, the manufacturer or importer must be able to initially demonstrate it has exercised reasonable diligence and made good faith efforts to obtain and integrate the information. The CSHO [Compliance Safety and Health Officer] must review the overall efforts and actions taken to comply. No citation will be issued in cases where the manufacturer or importer provides persuasive documentation to show that it made reasonable efforts to obtain the necessary information from upstream suppliers, and attempted to find hazard information from alternative sources (e.g., chemical registries) to classify the data. In these limited situations, manufacturer and importers must promptly create HCS 2012-compliant labels within six months after they develop the updated SDS. This accommodation is provided as a reasonable relief to the requirement under 1910.1200(f)(11) that container labels be revised within six months after learning of new hazard information. All containers shipped after the six-month period must be labeled with an HCS 2012-compliant label. Where a manufacturer or importer has not developed an HCS 2012- compliant label within six months of the date it developed its HCS 2012-compliant SDS, a citation for violation of 1910.1200(f)(1), (f)(2), and (f)(3) shall be considered. Manufacturers or importers of hazardous chemicals (including businesses that repackage) that have existing stock packaged (e.g., boxed, palletized, shrink-wrapped, etc.) for shipment prior to June 1, 2015, that are HCS 1994-compliant labeled, may continue to ship those containers downstream. In such instances, there is no requirement to re-label packaged for shipment containers with HCS 2012-compliant labels. The manufacturer or importer must provide HCS 2012-compliant labels for each and every individual container shipped and the appropriate HCS 2012-compliant SDS(s) with each shipment, unless the manufacturer or importer can demonstrate that it exercised reasonable diligence and good faith as discussed in this policy. After June 1, 2015, a manufacturer or importer of hazardous chemicals who packages containers for shipment must label each and every container with a HCS 2012-compliant label prior to shipping. Some businesses repackage, blend, or mix hazardous chemicals, but consider themselves to be distributors in the supply chain. Under the HCS, however, they are considered manufacturers, and the labelling guidance discussed above for manufacturers and importers applies to them as well. Guidance for distributors of hazardous chemicals The HCS 2012 permits distributors to continue to ship chemicals with HCS 1994 labels until December 1, 2015. There may be distributors that are consequently unable to comply with the December 1, 2015 effective date where a manufacturer or importer cannot comply with the June 1, 2015 effective date despite its reasonably diligent and good faith efforts. In these situations, CSHOs [Compliance Safety and Health Officers] must determine whether the distributor has evidence that it has in fact exercised reasonable diligence and good faith to comply with the December 1, 2015 effective date. Before December 1, 2015, distributors with existing stock packaged (e.g., boxed, palletized, shrink-wrapped, etc.) for shipment and containers that are HCS 1994-compliant labeled, may continue to ship those containers downstream. In these instances, there is no requirement to re-label packaged for shipment containers with HCS 2012-compliant labels. Distributors must provide a HCS 2012-compliant label for each and every individual container shipped and the appropriate HCS 2012- compliant SDS(s) with any future shipments after December 1, 2015 or upon request, unless they can demonstrate reasonable diligence and good faith as discussed in this policy. Additionally, distributors must provide HCS 2012-compliant SDSs to downstream users with the first shipment after a new or revised SDS is provided by the manufacturer or importer. All containers in the control of a distributor after December 1, 2017, must be HCS 2012-compliant labeled prior to shipping. What are Reasonable Diligence and Good Faith Efforts? Developed the course of action it will follow to make the necessary changes to SDSs and labels once the information becomes available. Although CSHOs [Compliance Safety and Health Officers] must evaluate all of the above factors, any combination of these efforts may be considered to be reasonably diligent and made in good faith. CSHOs shall also consider whether the manufacturer or importer attempted to obtain the hazard information in a timely manner (i.e., in a way that would have enabled it to comply with the June 1, 2015 effective date) in determining whether reasonable diligence and good faith efforts to comply are present. Additionally, manufacturers or importers should provide a clear timeline when it expects to comply with HCS 2012 to meet this test. In cases where a distributor cannot comply with the December 1, 2015 effective date, CSHOs [Compliance Safety and Health Officers] shall determine, on a case-by-case basis, whether the distributor exercised reasonable diligence and good faith to comply with the December 1, 2015 effective date. In making such determination, distributors must present documentation of any and all communications with the manufacturer or importer regarding its reasons for noncompliance with HCS 2012. Workplace Labels (sometimes called secondary, internal or in-house labels). Product identifier and words, pictures, symbols, or a combination thereof, providing general information on the hazards of the chemicals, and which, in conjunction, with other information immediately available to employees under the hazard communication program, will provide employees with the specific information regarding the physical and health hazards of the hazardous chemical, (f)(6)(ii). If symbols are used they must not contradict the pictograms, or use of the wrong symbol for a given hazard (e.g., using the symbol for oxidizers to signify carcinogens). Employers using alternative labeling systems must ensure that their employees are aware of all information required to be conveyed under the HCS. OSHA will make a plant-specific determination of the effectiveness of the complete program when an inspection is conducted. Any employer who relies on one of these types of alternative labeling systems, instead of using labels containing complete health effects information will - in any enforcement action alleging the inadequacy of the labeling system - bear the burden of establishing that it has achieved a level of employee awareness which equals or exceeds that which would have been achieved if the employer had used labels containing complete health effects information (59 F.R. 6156). The key to evaluating the effectiveness of any alternative labeling method is to determine whether employees can correlate the visual warning on the in-plant container with the applicable chemical and its appropriate hazard warnings. The alternative labeling system must also be readily accessible to all employees in their work area throughout each work shift. For purposes of this provision, the term "other information immediately available" does not include safety data sheets used in lieu of labels. The workplace (i.e., in-house) label does not need to include the pictogram or a description of the pictogram. If a pictogram is used, it can be used with a black border. This is acceptable ONLY for in-house labels. Precautionary statements and hazard statements may be used on the in-house labels but are not required. The NFPA or HMIS rating systems do not directly correlate with the HCS classifications (e.g., the NFPA rating of 1 ("low") does not correlate with HCS classification of 1 ("high")). However, the HMIS or NFPA system may be used as part of an employer's workplace labeling system, if used in accordance with the NFPA and HMIS guidelines and as long as it does not cast doubt or contradict the validity of the label information. Employers must ensure that their training program instructs employees on how to use and understand the alternative labeling systems so that employees are aware of the effects of the hazardous chemicals to which they are potentially exposed. CSHOs [Compliance Safety and Health Officers] should determine whether workers can recognize what hazards correspond to what code ratings/symbols. This can be achieved through employee interviews. Workplace labels must include the product identifier and general information regarding all of the hazards of the chemical(s) even when using the NFPA or HMIS system. In some cases, all hazards are not addressed by a particular rating system (e.g., chronic health hazards), and therefore, hazards not addressed must be communicated by words, pictures, symbols, or a combination thereof in addition to the NFPA or HMIS rating system. If any of the required label information is missing, it is not compliant with the standard. For additional guidance on use of the NFPA rating systems, please see http://www.osha.gov/Publications/OSHA3678.pdf. If a material received was shipped under the (f)(4) solid materials special label transmission rules, the workplace labeling requirements in (f)(6) would begin only once the chemical is brought into the work area where it will be processed in a way to create a hazardous condition, e.g., combustible dust. If the chemical will first be placed in a stationary process container (e.g., grinder) where it will be processed in a way that creates a combustible dust hazard, the downstream user would be required to label the stationary process container with the Section 1910.1200(f)(6) label, or may comply with the alternative labeling methods provided by Section 1910.1200(f)(7), and need not label the shipping container. If the chemical will first be placed in a non-stationary process container where it will be processed in a way that creates a combustible dust hazard, the downstream user would be required to label the non-stationary process container with the Section 1910.1200(f)(6) label, but not the shipping container. The workplace labeling requirements in (f)(6) apply only to chemicals that are in containers. Therefore, items which may be hazardous but are not in containers do not need to have workplace labeling. Some of these products may be received under the (f)(4) solid materials labeling exemption. Individual boards or pipes that might create a combustible dust hazard when cut do not need to be labeled under (f)(6). The employer has other responsibilities under HCS 2012 for products not requiring workplace labels, including training, maintaining SDSs, and providing SDSs to employees. Employer may use, for example, signs, placards, process sheets, batch tickets or operating procedures instead of affixing labels to individual stationary process container. Alternative method must identify the container(s) to which it is applicable and conveys the information required by paragraph (f)(6). The employer must ensure that the written material (e.g., batch sheets) is readily available to each employee in the work area during their work shift. If the hazardous chemical, in the container, in its shipped form, is a combustible dust (e.g., flour, aluminum powder, carbon black), then it must be labeled in accordance with the standard. Under Appendix C, C.4.30, footnote 2, if a material is a solid or a liquid when shipped and the only HCS 2012 hazard is combustible dust when the material is processed, then the labeler may comply with the labeling rules of (f)(4). See further discussion of (f)(4) below under labeling of solid materials. Other federal agency labeling requirements. Be sure you're in compliance with DOT placards and labels from Safety Emporium. 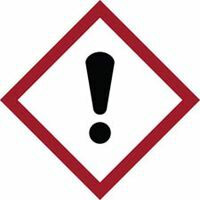 The HCS 2012, paragraph (c), defines pictogram as "a composition that may include a symbol plus other graphic elements, such as a border, background pattern, or color, that is intended to convey specific information about the hazards of a chemical." 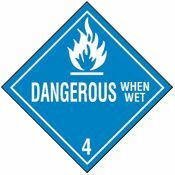 The DOT requires diamond-shaped placards (labels) containing hazard symbols for the transport of chemicals. Therefore, because DOT labels contain symbols, they are considered pictograms under HCS 2012. During transportation, the DOT label requirements take precedence over the requirements of HCS 2012, as indicated in (f)(5). Appendix C, C.2.3.3, of the standard, states: "Where a pictogram required by the Department of Transportation under Title 49 of the Code of Federal Regulations appears on a shipped container, the pictogram specified in C.4 for the same hazard shall not appear." 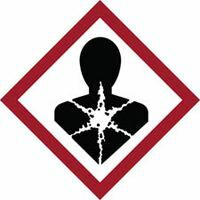 However, since OSHA proposed the modification to the HCS, DOT has updated its regulation to state that GHS pictograms would not be in conflict with a DOT label. Therefore, OSHA intends to revise Appendix C, C.2.3.3 of the standard, and in the interim, OSHA will allow labels to contain both DOT pictograms (labels as they are referred to by DOT) and the HCS pictograms for the same hazard. The label may display both pictograms for the hazard. For hazards where DOT requires no pictograms (e.g., carcinogens), HCS pictograms must appear. DOT Tanker Truck and Railroad Tank Car Labeling. In situations where a tank truck, rail car, or similar vehicle comprise the container for the hazardous chemical, the labeling information may either be posted on the outside of the vehicle or attached to the accompanying shipping papers or bill-of- lading. A label may not be shipped separately, even prior to shipment of the hazardous chemical, since to do so defeats the purpose of providing an immediate hazard warning. 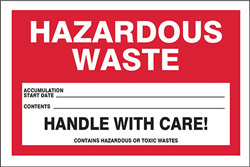 Mailing labels directly to purchasers bypasses employees involved in transporting and handling the hazardous chemical. (Note the exemption in (f)(4)(i) for solid metals, plastic items, shipments of whole grain, and solid wood (i.e., untreated lumber)). If a tanker truck or railroad tank car that is labeled in accordance with the DOT labeling requirements arrives at a facility and is offloaded into a storage tank, without storage of the tanker truck or railroad car, the DOT labeling would be sufficient on the tanker truck or railroad car. If the tanker truck or railroad tank car is stored (wheels chocked and cab/engine disconnected from the tanker/rail car) prior to offloading, the requirements of HCS apply and the labels must comply with (f)(7). 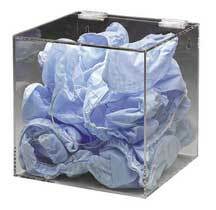 (OSHA is allowing this to be labeled as a stationary process container). If the tanker truck or railroad tank car becomes part of the process (e.g., hooked up to the piping system, used as a process container), it must be labeled in accordance with paragraph (f)(7). OSHA is allowing this to be labeled as a stationary process container. If the tanker truck or railroad tank car is used as a transport container in-house (e.g., internal railroad car system), (f)(7) does not apply and the container must be labeled in compliance with the workplace labeling rules in (f)(6)(i) or (ii), as the container is no longer stationary. Hazardous chemicals that are "consumer products" under the Consumer Product Safety Act or a "hazardous substance" under the Federal Hazardous Substances Act and subject to the labeling requirements of those laws are exempt from HCS labeling under paragraph (b)(5)(v). CPSC labels often do not contain all the hazard information relevant to worker exposure, therefore a product containing both the CPSC label information and the HCS 2012 hazard information must be labeled so as to avoid contradicting or casting doubt on the hazard(s) of the chemical to workers who may use it. HCS label information may also be present as long as the HCS information does not cast doubt or cause confusion. See X.C.6 of this Instruction for a definition of Consumer Products. CSHOs [Compliance Safety and Health Officers] finding unlabeled designated medical gas cylinders should refer this issue to the FDA. Small Container Labeling (e.g., small vial, bottle, tube). OSHA will evaluate, on a case-by-case basis, other systems (e.g., labeling of the box) used for labeling smaller containers. This evaluation will be to determine compliance and not as an approval of a specific labeling system. OSHA has granted the following practical accommodation for small container labels where manufacturers can show that it is not feasible to use pull-out labels, fold-back labels, or tags, containing the full HCS 2012-required information. OSHA does not consider an increase in cost for the use of tags, fold-back labels, or pull-out labels an acceptable reason to use this practical accommodation. A statement indicating the full label information for the chemical is provided on the outside package. All the applicable label elements, as defined in (f)(1). The outside packaging described above is the object (e.g., bag, box) that the immediate product container is placed into; it does not refer to the exterior shipping container. The outside package must be clearly marked to ensure the complete label elements are visible, and it must clearly inform users that the small container must be stored in the outer container bearing the complete label. The complete label must be maintained on the outer package (e.g., not torn, defaced, destroyed). The manufacturer must ensure that any alternative labeling used does not conflict with any other standards. As such, the external packaging must not present a hazard while the material is being stored (e.g., combustible material being stored in a flammable locker). OSHA shall treat any deviation from the above practical accommodation as potential noncompliance with the requirements of (f)(1) and as such may issue citations for all required information not being present on the label. Some items are sold as individual components within a kit (e.g., a fiberglass repair kit contains multiple items: fiberglass resin and liquid hardener). Each individual container of hazardous chemicals in a kit must have its own SDS and each chemical must be labeled on the container according to the requirements of (f)(1). For solid metal, solid wood, and plastic items that are not exempted as articles, whole grain, and in the circumstances noted in the second part of footnote 2 to Appendix C, C.4.30, the requirements of the HCS apply. For each shipment of these materials there is a limited labeling exemption under (f)(4). A label can be provided prior to or with the first shipment. The label does not need to be transmitted for subsequent shipments. If the information on the label changes, the first shipment following the change must include an updated label. Materials which may create a combustible dust when processed may use the (f)(4) limited labeling exemption. See LOI to API found at https://www.osha.gov/pls/oshaweb/owadisp.show_document?p_table=INTERPRETATIONS&p_id=28949. 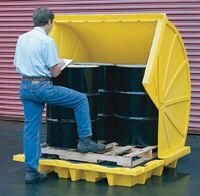 Portable containers do not need to be labeled if the hazardous chemicals were transferred from a labeled container, and which are intended only for the immediate use of the employee who performs the transfer. CSHOs [Compliance Safety and Health Officers] must determine that containers are labeled with the appropriate information, that the labels are legible, and that the labels are prominently displayed.Stationary Process Containers. Labels must be in English but may also be printed in other languages.Stationary Process Containers. The CSHO [Compliance Safety and Health Officer] must determine whether the product identifier can be cross-referenced with the SDS and to the inventory list of hazardous chemicals. 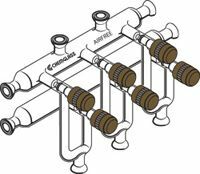 Handle pyrophoric liquids safely with high vacuum manifold systems from Safety Emporium. CSHOs [Compliance Safety and Health Officers] must evaluate the effectiveness of workplace (in-house) labeling systems. This includes review of training, SDS procedures, and employee interviews (to determine their knowledge of chemical hazards in the workplace). An effective labeling system is one that ensures that employees are aware of the hazardous effects of the chemicals to which they are potentially exposed. Based on the requirements of (f)(1) and the definition of container, the label must be attached to the immediate container of the hazardous chemical (labeling for small containers and kits are discussed above). CSHOs [Compliance Safety and Health Officers] must evaluate alternative labeling provisions for containers which are difficult to label (e.g., small, odd shape) and the employer can show that it is not feasible to comply with the requirements of (f)(1) using pull-out labels, fold-back labels, or tags. The practical accommodation for small shipped containers can be found in section X.F.5.c of this Instruction. Guidelines for referrals regarding inadequate labels are dealt with in Appendix G of this Instruction. Citations shall generally be issued as serious unless otherwise noted. Chemical manufacturers, importers, and distributors shall be cited for the specific subsection(s) of paragraph (f)(1) for missing required sections of container labels. Downstream users shall not be cited for deficiencies in manufacturer', importers', or distributors' labeling. If deficiencies are noted on a manufacturer's or importer's label during an inspection, the CSHO [Compliance Safety and Health Officer] should make a referral to the Area Office that has jurisdiction over the manufacturer's location. See Appendix G of this Instruction for a discussion of referral procedures and a sample letter to be sent to manufacturer(s) or importer(s). If the company name is different on the SDS and the label, the citation shall be issued to the company who most recently put their name on the label or SDS. For example, if the company is repackaging a material and putting their name on the label but not on the SDS, the citation would be against the repackager and not the company on the SDS. In this instance, all citations related to the SDS and label would be issued to the repackager. A citation for labeling under (f)(1)(iv), referencing Appendix C, paragraph C.3.1, may be issued to the manufacturer or importer if the same pictogram is repeated multiple times. The employer may be cited for paragraph (f)(6)(ii) if workplace (in-house) containers of chemicals are not labeled or if the container is missing information such as the product identifier or hazard description. If the employer chooses to comply with the workplace labeling requirements by using the information from (f)(1)(i) through (f)(1)(v), but does not include all the information or incorrectly includes the information from the shipped containers, the employer may be issued citations under paragraph (f)(6)(i). If the employer is labeling portable containers under the stationary process container labeling requirements, citations shall be issued under (f)(6)(ii). If stationary process containers cannot be identified by the alternative method or are not labeled; if the alternative method does not convey the information required by (f)(6) to be on the label; and/or the stationary process containers are identified but the written material is not readily accessible to employees, (f)(7) shall be cited. The removal or defacing (e.g., partial covering of the label by paint) of incoming labels (shipped container labels) shall be cited under paragraph (f)(9). However, if the container is immediately marked with the required information, (f)(9) may not be cited. The employer shall be cited for paragraph (f)(10) if the in-house labeling is not legible (e.g., font size too small), written only in a language other than English, or not prominently displayed on the container/readily available in the work area. When a CSHO [Compliance Safety and Health Officer] is inspecting a manufacturer, importer or a distributor who has become the responsible party and discovers the labels were not updated within six months of becoming aware of new information, a citation shall be issued for (f)(11). A distributor becomes responsible if it has altered the manufacturer's or importer's SDS or label. If the CSHO is inspecting an employer and the workplace labels have not been updated within six months of the employer becoming aware of new information (e.g., new information on the shipped container label), a citation shall be issued for (f)(11). 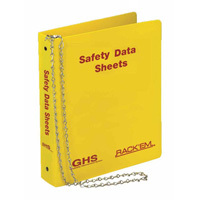 Safety Data Sheets (SDSs), Paragraph (g). Chemical manufacturers and importers must develop safety data sheets in accordance with the HCS 2012 by June 1, 2015. 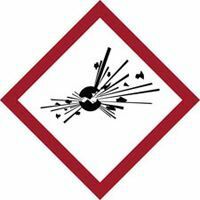 Reduce the risk of working with potentially explosive materials with laboratory shields such as this one from Safety Emporium. Attempts to classify the data themselves. In this limited circumstance, a manufacturer or importer must update its material safety data sheet (MSDS) to an HCS 2012- compliant SDS within three months from the date it has or receives all of the hazard information for the ingredient(s). The manufacturer or importer must provide the HCS 2012-compliant SDS downstream with the next shipment of the chemical and when requested by a distributor or employer. The chemical manufacturer or importer must not wait to create all of its SDSs all at once. Where a chemical manufacturer or importer has not developed an HCS 2012-compliant SDS within six months of receiving the necessary hazard information, a citation for a violation of 1910.1200(g)(2) shall be considered. Related violations of 1910.1200(d)(1), (d)(2), and (d)(3)(i) may also be considered. The standard requires chemical manufacturers and importers to develop or obtain an SDS for each hazardous chemical they produce or import. This section, (g), was updated to require a standardized format of SDSs with specific information requirements for each section. For additional guidance, see http://www.osha.gov/Publications/OSHA3514.pdf. The SDS must be provided and maintained in English. However, the SDS may be translated into other languages that workers speak to aid in comprehension and training. The SDS may not indicate that OSHA approved the classification, as OSHA does not approve SDSs or classifications. OSHA does not maintain a national repository of SDSs. Each employer is required to maintain SDSs for each hazardous chemical they receive. Manufacturers and importers shall ensure that distributors and employers are provided an appropriate SDS with their initial shipment, and with the first shipment after a SDS is updated. The requirement to provide SDSs does not change due to label exemptions or special labeling circumstances (e.g., solid materials). Manufacturers, importers and distributors must supply the SDSs at no cost. If inadequate SDSs (or MSDSs) are found during inspections, referrals to other Area Offices will be carried out as outlined in Appendix G of this Instruction. Chemical manufacturers or importers that become aware of significant new information must update their SDS within three months, (g)(5). SDSs must be obtained or developed for each hazardous chemical manufactured or imported. This includes developing SDSs for newly synthesized and/or uncharacterized chemicals. All the information that is known for these newly synthesized/uncharacterized chemicals must be provided on the SDS. This SDS must be provided when or if the chemical is distributed--even if the receiving party is the laboratory that is doing the characterization of the material. If a solid material, not in dust form, has the potential to become a combustible dust in normal conditions of use or foreseeable emergencies, this hazard must be listed on the SDS. SDS requirements apply to free samples provided by chemical manufacturers and importers since the hazards remain regardless of the cost to the employer. SDSs must be specific to the product (except as outlined below for generic mixtures) and manufacturer. An individual SDS is required for the final product. Multiple SDSs from the individual components of a mixture may NOT be substituted for a single SDS that describes the hazards of the product or material. The SDS must identify the hazards of the final product/material, e.g., the flash point listed must be for the product; it is not acceptable to list the flash points for the individual components. A manufacturer, importer, or distributor may create one SDS to cover two or more mixtures that are composed of essentially the same ingredients, have similar hazards, but the specific composition varies from mixture to mixture (e.g., there may be a range but all products are Skin Category 1), (g)(4). A single SDS may also be created when there is a batch-to-batch variability in the production of a mixture. 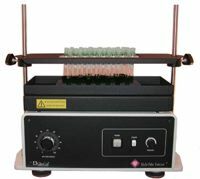 Where a single SDS is used for similar mixtures or in cases of a batch-to-batch variability, concentration ranges of ingredients may be used. For example, a group of products in a product line (such as paint) may be comprised of a base material and several additional ingredients (such as pigments) that vary from product to product. If these additional ingredients have similar hazards that fall within the same cut-off values/concentration limits as that of the base material and do not react, one SDS listing the different possible combinations of hazardous ingredients may be used for the entire line even though the quantities and number of pigments may vary from product to product. If the ingredients being added have different hazards (e.g., one pigment is a carcinogen and the rest are not), the manufacturer or importer must use separate SDSs for the products with these additional hazards. Any party who changes the SDS (for example, changing the name or identity of the chemical) becomes responsible for the SDS under (g) regardless of whether it is a chemical manufacturer, importer, distributor or employer. The named party on the SDS must be the same as the named party for the label. If there is a different company name on the SDS versus the label, the company that changed the name is responsible for both. If the employer is maintaining one SDS for a particular chemical but uses that same chemical from a different manufacturer or importer without obtaining/maintaining the SDS from the new manufacturer or importer, the employer is not compliant. If the SDS received from the manufacturer, importer or distributor has a different responsible party name than that on the product label, the employer must make a documented good faith effort to receive the appropriate SDS or they are not compliant. If a CSHO [Compliance Safety and Health Officer] encounters a situation where the manufacturer, importer or distributor is providing SDSs that list a different responsible party than that on the label, referral procedures outlined in Appendix G of this Instruction must be followed. The company that has made the alteration (e.g., adding its name to the label but not to the SDS) is the company which violated the standard. SDSs must be in the format outlined in (g)(2) of the standard and contain at the minimum the information outlined in Appendix D of the standard. All information needs to be filled in. If the company preparing the SDS does not have relevant information for any sub-heading within a section it must be marked "not applicable (N/A)" or "none" to indicate that no information was found, (g)(3). The information supplied on the SDS must be accurate. The company preparing the SDS must accurately report their classifications which must be based on valid scientific data. The named party is accountable for the content of the SDS (or MSDS). If the named party has information concerning the chemical (e.g., flash point), they are required to disclose that information on the SDS (or MSDS). If the company has information that is not required by Appendix D of the standard to be disclosed, but it would provide pertinent communication about the safe use of the product (e.g., a chemical that can dissolve rubber), OSHA recommends this type of information be in Section 16, Other Information, of the SDS. The CSHO [Compliance Safety and Health Officer] must ensure compliance with the SDS transmission provisions of the standard by reviewing the chemical manufacturer's, importer's, or distributor's program for transmitting the SDSs (including updated SDSs) to downstream users. The SDS must be transmitted with the first shipment of the chemical to each downstream location that receives the material; shipping the SDS to only one facility when the downstream customer has had the chemical delivered to multiple facilities is not in compliance. Area Offices should expect to receive requests from employers to assist them in obtaining SDSs or labels in situations when an inspection has not been conducted. If the Area Director determines that the employer has tried to obtain the information, and has not been able to do so, a letter and/or telephone call from the Area Office to the supplier or manufacturer is the appropriate action in this situation. If a letter and/or telephone call from the Area Office do not resolve the issue, an inspection may be warranted of the manufacturer or distributor. See Appendix G of the Instruction for referral procedures. Ensure that the receiving employer has agreed to receive the SDS electronically. This is an "opt-in" system, the employer must agree to the use of electronic distribution; the manufacturer, importer or distributor cannot force an employer to accept electronic distribution of SDSs. Ensure that the employer has all the information necessary to access the SDS (e.g., site address, passwords); the manufacturer must be able to verify that the employer has access and receives the SDS. Ensure that the employer is notified when the SDS is updated; a system needs to be in place to verify that the employer is notified. The manufacturer, distributor, or importer cannot require the employer to purchase new technology in order to access the SDS. Nor can they require the employer to buy the media (e.g., CD, flash drive) containing the SDS. SDSs must be provided at no cost to the employer. The employer may choose to "opt-out" of an electronic distribution system at any time. Subsequently, the manufacturer, importer or distributor must provide by non- electronic means or a hard copy of the SDS with the next shipment after the "opt-out" and whenever the SDS is updated. The use of electronic distribution does not eliminate the manufacturer's, or importer's obligation under (g)(6)(iv) to provide a hardcopy of the SDS upon request by the distributor or employer. Requirements for Manufacturers and Importers. 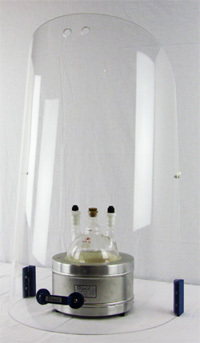 Safety Emporium has all kinds of lab equipment such as valves and faucets. Manufacturers or importers who choose to purchase SDSs for their products or obtain data from sources such as, but not limited to, internet providers or information from other SDSs (or MSDSs), retain responsibility for the downstream flow of information and for assuring SDS (or MSDS) accuracy. Manufacturers, importers and distributors are required to provide SDSs to each employer that use a hazardous chemical (retail establishments must provide SDSs to employers with commercial accounts, upon request). Manufacturers and importers are required to provide SDSs to distributors and employers upon request. The standard requires SDSs only for hazardous chemicals. The HCS does not require manufacturers, or importers to supply SDSs for non-hazardous chemicals. Distributors who in good faith choose to rely upon the SDSs provided to them by the manufacturer or importer assume no responsibility for the content and accuracy of the SDS, unless the distributor changes the SDS. Distributors that only add their name to an SDS, without removing the manufacturer's or importer's name and contact number, and makes no other changes to the information on the SDS, is not responsible for any information on the SDS. Distributors who substitute their names on the SDS in place of the manufacturer's or importer's information become responsible for the accuracy and completeness of the SDS. The company name on the label and on the SDS must be the same. If the distributor removes the manufacturer's name from the label but leaves it on the SDS, they are not in compliance with the standard. When a distributor has not received an SDS, the CSHO [Compliance Safety and Health Officer] will recommend that the distributor contact the chemical manufacturer or importer of the chemical and request an SDS. If the distributor fails to receive the SDS within a reasonable period of time, e.g., five working days, the Area Director shall follow the referral procedures in Appendix G of this Instruction. If an employer has made a good faith effort to contact the manufacturer, importer or distributor because they have not received the SDS and still has not been able to receive an SDS, the Area Office may be contacted to provide assistance. A letter and/or telephone call from the Area Office to the manufacturer, importer or distributor is the appropriate action in this situation. See Appendix G of this Instruction. If the letter and/or telephone call do not resolve the issue, an inspection may be warranted of the manufacturer, importer, or distributor. See Appendix G of this Instruction for referral procedures. Employers assume no responsibility for the content and accuracy of the SDS provided to them by the manufacturer, importer or distributor, unless the employer changes the SDS. Employers are required to maintain SDSs (or MSDSs) for each hazardous chemical they use. The HCS does not specify how the SDS (or MSDS) is to be maintained (e.g., paper, electronic), as long as employees have immediate access to the SDS (or MSDS) in their work area. (Note: Older versions of SDSs (or MSDSs) may still need to be maintained as an employee exposure record under OSHA's Access to employee exposure and medical records standard, 29 CFR 1910.1020). If an SDS is provided for a non-hazardous material, the receiving party is not required under HCS to maintain that SDS. Employers must maintain the most recent received version of the SDS (or MSDS). When an SDS is received, it must replace the MSDS for the corresponding hazardous chemical. Different manufacturers, importers and distributors may issue SDSs at different times. An employer that is maintaining an MSDS for a product not recently received, even after June 1, 2015, would be considered to be compliant with HCS 2012, unless the manufacturer, importer or distributor has provided an SDS and the employer did not maintain the new SDS. Maintenance of SDSs in electronic format. The employer must not require employees to perform an Internet search (e.g., Google®, Yahoo®) to view/obtain the SDS. The employer may make SDSs available to employees on a company website or contract with an off-site/web-based SDS service provider. There is a procedure or system in place to ensure that employees can receive a hard copy if so desired and in cases of emergency (which must be transmitted to medical personnel). It is not acceptable to only transmit the information verbally. Employees must have unrestricted access to SDSs. This means the employer cannot require workers to ask for the SDS (e.g., stored in a locked office). There is no requirement to translate SDSs (e.g., into a foreign language, braille). However, it is recommended that the employer ensure that information from the SDS is available to employees in a manner they would understand easily in case of emergency. Employers may be cited if CSHO [Compliance Safety and Health Officer] interviews reveal that workers do not have an understanding of the chemical hazards they work with or are in their work area. SDSs may be stored at a primary workplace instead of a mobile, remote, or temporary worksite (e.g., construction worksite), as long as there are no restrictions to workers' access. If the SDSs are stored at the primary workplace, the employer must ensure there is no delay in a worker receiving a requested SDS while at any mobile, remote, or temporary worksite. Access may be accomplished by having a representative always available at the primary workplace or through other technological means (e.g., email, smart phone, electronic tablet). The employer must address in their written hazard communication program how SDS information will be conveyed to remote worksites. OSHA will not cite companies for maintaining MSDSs when these products were received prior to June 1, 2015. If the manufacturer has gone out of business, the employer's responsibility is to maintain the SDS (or MSDS) for that product and not to create a new SDS. The HCS 2012 does not require employers to contact manufacturers, importers or distributors to obtain new SDSs of products for which they currently have MSDSs. Employers may contact manufacturers, importers or distributors of products they have previously ordered from to request new SDSs, and if they do so, the manufacturer or importer must provide the SDS under section 1910.1200(g)(6)(iv). Requirements of Specific Sections of the SDS. Specific issues that have arisen concerning sections of the SDSs are outlined here. Appendix H of this Instruction provides CSHO [Compliance Safety and Health Officer] guidance when reviewing an SDS for completeness. The SDS requires the inclusion of the contact information for the manufacturer in addition to emergency contact numbers. There is no requirement for the emergency number to be staffed 24 hours per day if the SDS specifies the restrictions on the contact hours. The emergency contact number can be for a company contracted to provide information in the case of an emergency (e.g., Chemtrec). There must be someone available at the emergency phone number who is able to provide more information concerning the product. Section 2 - Hazard(s) identification. The classification must include the class and the category, e.g., Flammable Liquid, Category 1. HNOC must be listed in section 2 of the SDS. As HNOCs are identified through the 1910.1200(d) hazard classification process, it is permissible to include information on HNOCs under subheading (a). The manufacturer, importer or distributor may include hazard symbols on the label or SDS for HNOCs as long as that symbol is not an HCS 2012 pictogram and does not contradict or cast doubt on the information that is required. Precautionary statements are not required for combustible dust hazards and, therefore, none are required in section 2 of the SDS if combustible dust is the only hazard listed. 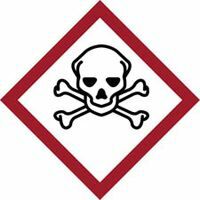 Appendix D of the HCS, section 2, states, "Hazard symbols may be provided as graphical reproductions in black and white or the name of the symbol, e.g., flame, skull and crossbones." The hazard symbol is the symbol inside the frame of the pictogram. Therefore, just the symbol can be used or the name of the symbol can be used. If the pictogram is used, it may be printed in black and white. If additional information is added to the required hazard statements or precautionary statements on the label, it is consistent to include that language on the SDS. Responsible parties may add their own precautionary statements to section 2 of the SDS so long as they are relevant and do not contradict or cast doubt on the validity of the other information in the SDS. Responsible parties may include rating systems (e.g., HMIS, NFPA) in section 2 of the SDS as long as they do not contradict or cast doubt on the HCS 2012 classification. Section 3 - Composition/information on ingredients. If a component may be released to create airborne concentrations above an OSHA PEL or an ACGIH TLV®, it is considered a health hazard and must be included on the SDS. Section 8 - Exposure controls/personal protection. The requirement to include PELs and TLVs® in section 8 of the SDS applies to any constituent or ingredient (including additives and impurities) that is present in the mixture or substance above its cut-off value, or if it is below the cut-off value but still contributes to the hazard classification of the mixture. The list of constituents in sections 3 and 8 must be the same. If a constituent does not have a PEL or TLV®, its exposure limit must be listed as "not applicable (N/A)" or "none." If the manufacturer, importer, or distributor chooses to list another recommended occupational exposure limit, for example, NIOSH Recommended Exposure Limit (REL), the correct limit must be used or it must say "not applicable (N/A)" or "none." It is permissible to state, "The following constituents are the only constituents of the product which have a PEL, TLV® or other recommended exposure limit. At this time, the other constituents have no known exposure limits." Section 9 - Physical and chemical properties. All the items listed in Section 9 of Appendix D must be present on the SDS. If an item(s) is not applicable then it must be marked with "not applicable (N/A)," or "none." If the item is listed in another section (e.g., flash point also listed in section 5) it must still be listed in section 9. Other physical and chemical properties may also be listed in addition to listed items. Sections 12-15 - Ecological Information; Disposal considerations; and Transport information. OSHA is not requiring these sections to be filled out; however, the section headings must be present. Section 16 - Other information, including date of preparation or last revision. This section is officially titled, "Other information, including date of preparation or last revision." It is acceptable to shorten the title to "Other information" as long as the date of preparation or last revision is listed. When inspecting manufacturers, importers or employers, CSHOs [Compliance Safety and Health Officers] must evaluate the compliance status of this provision by examining a sample of SDSs to determine that the SDSs have been obtained or developed in accordance with HCS 2012. 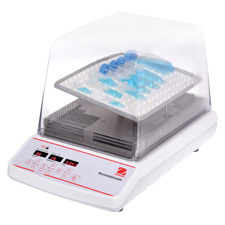 Safety Emporium has all kinds of lab equipment such as stirring hot plates. Providing SDSs of the individual components of a mixture is not in compliance with the standard. Manufacturers or importers must provide a single SDS for a mixture. Does each SDS contain information which adequately addresses at least the elements required by the standard at (g)(2)(i)-(xvi)? Are the sections of the SDS corresponding with paragraphs (g)(2)(i) through (g)(2)(xi) and (g)(2)(xvi) of the standard accurately completed? If no relevant information is available, the manufacturer, importer or employer must state that "no applicable information was found." The section numbers and headings required by paragraphs (g)(2)(xii) - (g)(2)(xv) must be present. However, OSHA is not enforcing the content of these SDS sections. Appendix H of this Instruction contains an outline of the required SDS sections and provides additional guidance about the information that needs to be included in these sections. In the event that there are any questions concerning the accuracy or completeness of the product's chemical ingredients listed in SDS section 3, "Composition/information on ingredients," the CSHO [Compliance Safety and Health Officer] may contact the SLTC for assistance in determining the proper way to collect a bulk sample of the product in question for chemical analysis. Do employers have an SDS for each hazardous chemical in their workplace? CSHOs should review a representative number of SDSs against the company's inventory list. Is the SDS current? - Employers must maintain the most current version of the SDS provided by the manufacturer, importer or distributor. For purposes of HCS 2012, it is not compliant to only maintain a version previously received if the employer has ordered the chemical after the date the manufacturer has updated the SDS. If the employer has not ordered the product after June 1, 2015, and is maintaining a current HCS 1994-compliant MSDS as of the last shipment received of the product, they are in compliance with the requirements of the standard. (Note: Older versions of SDSs (or MSDSs) may still need to be maintained as an employee exposure record under OSHA's Access to employee exposure and medical records standard, 29 CFR 1910.1020). The CSHO [Compliance Safety and Health Officer] shall ensure compliance with the SDS transmission provisions of the standard by reviewing the chemical manufacturer's, importers' or distributor's program for transmitting the SDSs (including updated SDSs) to downstream customers. Citations shall generally be issued as serious, unless otherwise stated. Citations to manufacturers or importers for incomplete or inaccurate SDSs shall include an abatement requirement for the transmittal of corrected SDSs to all customers with the next shipment of the chemical. Citations shall not be issued to the employer for errors or deficiencies on the SDS when they are not responsible for the contents of the SDS. CSHOs [Compliance Safety and Health Officers] shall cite (g)(1) whenever an inspection reveals that an employer does not have an SDS, unless a the employer can establish that a good faith effort has been made to obtain the SDS (e.g., documented phone calls, email, letters) from the manufacturer, importer or distributor. If the complete manufacturer, importer or distributor contact information is located directly above section 1 of the SDS, it is a de minimis violation and a citation should not be issued. If a manufacturer or importer provides an SDS that does not contain the headings of sections 12-15, citations shall be issued under (g)(2)(xii) through (g)(2)(xv). NOTE: The headings are required to be present but OSHA is not requiring information to be in these sections as this information is not within OSHA's jurisdiction. Citations in this situation shall generally be issued as other-than serious; if appropriate they should be grouped. Get your Class D and other specialty extinguishers from Safety Emporium. If the manufacturer or importer has not provided the SDS at the time of shipment, a citation shall be issued under (g)(6)(i). If the manufacturer or importer did not provide the SDS upon request, a citation shall be issued under (g)(6)(iv). If the distributor did not provide the SDS with the shipment, a citation shall be issued under (g)(7)(i). If the retail distributor did not provide the SDS upon request, a citation shall be issued under (g)(7)(iii). If the wholesale distributor did not provide the SDS upon request, a citation shall be issued under (g)(7)(vi). If an employer possesses an SDS but it is not readily accessible to employees while in their work area, a citation shall be issued under (g)(8). Violations of (g)(8) shall also be cited when an employer using electronic access as an integral part of the hazard communication program does not have an adequate backup system to address emergency situations. On multi-employer worksites, citations for violations of (g)(8) of the standard shall be issued to the employer responsible for making the SDS(s) readily accessible, as discussed below. For example, if an employer on a multi-employer worksite brings hazardous chemicals onto that site and fails to inform other employers about the presence of those chemicals and/or the availability of the SDS(s), that employer shall be cited for violation of (g)(8) grouped with (e)(2)(i). If the employer uses a general contractor or other employer as an intermediary for storage of the SDS(s), and that intermediate employer has agreed to hold and provide ready access to the SDS(s), then the intermediate employer becomes the controlling employer, and is responsible for ensuring the availability of the SDS(s). If the SDS(s) are not available because the subcontractor or immediate employer failed to make them readily accessible, then the subcontractor shall be cited for violation of (g)(8). Employee Information and Training, Paragraph (h). The standard requires the employer train employees on hazardous chemicals in their work area. Training is required to be provided at no cost to the employees. Employees must be paid for the time they spend at training. The employer is responsible for ensuring that employees are adequately trained, regardless of the method (e.g., contractor- provided training) relied upon to comply with the training requirements. The training provisions of the HCS are not satisfied solely by giving employee the data sheets to read. An employer's training program is to be a forum for explaining to employees not only the hazards of the chemicals in their work area, but also how to use the information generated in the hazard communication program. This can be accomplished in many ways (audiovisuals, classroom instruction, interactive video), and should include an opportunity for employees to ask questions to ensure that they understand the information presented to them. Furthermore, the training must be comprehensible. If the employees receive job instructions in a language other than English, then the training and information to be conveyed under the HCS will also need to be conducted in a foreign language. Training is required at the time an employee is assigned to work with any hazardous chemical and whenever a new hazard is introduced into the employee's work area. The requirement for an employer to provide updated training is based on the hazard, not the chemical. However, an employer may choose to train based on the chemicals. For example, if an employee is working with one flammable solvent and a second flammable solvent is introduced, the training does not need to be updated. However, if the employee is working with a flammable solvent and a corrosive is introduced, the training needs to be updated. In multi-employer worksites the employer is responsible for providing updated training when their employees are exposed to new hazards, even if these hazards are created by other employers. NFPA signs and kits are available at Safety Emporium. Training on labeling includes information about shipped container labels. The workplace labeling system used by the employer. For example, if the workplace labeling system includes HMIS or NFPA rating systems, workers must be trained to understand what these systems mean, how to utilize the information, etc. If the employer has hazardous chemicals labeled under HCS 1994 in the workplace, the employer must provide training on the different labeling systems to ensure that employees understand that the lack of pictograms, hazard statements, etc., do not mean that the hazards do not exist. The employer must ensure that employees understand that the labeling system for shipped containers has changed since the purchase of these items. The employer must also ensure that employees are aware of where they can get all the information on the hazards of these chemicals. Whether a citation is warranted must be evaluated on a case-by-case basis. How to obtain and use the hazard information on an SDS (including the format). If the employer is maintaining MSDSs for products received prior to June 1, 2015, the employer must provide training covering the differences between MSDSs and SDSs and how to utilize the MSDS. What operations have hazardous chemicals present; how employees are to protect themselves from hazardous chemicals. How the employer monitors (e.g., monitoring devices, visual, odor) for hazardous chemicals. The physical and health hazards (including hazards not otherwise classified) of the chemicals in the work area. Measures employees can take to protect themselves from the hazardous chemicals including any specific procedures (e.g., work practices, emergency procedures, PPE). Training must be provided a manner that the employees comprehend. If employees do not speak English and are given work instructions in a foreign language, the training must be provided in that language. If employees have low literacy, training must be provided so they can understand it (e.g., verbal instruction vs. reading documents). A self-paced, interactive computer-based training can serve as a valuable training tool in the context of an over-all hazard communication training program. However, use of computer-based training by itself would not be sufficient to meet the intent of the standard's various training requirements. Employees must have the opportunity to ask questions and receive responses in a timely manner. Staffing agencies and host employers share control over temporary employees, and are therefore jointly responsible for ensuring that they are effectively informed and trained regarding exposure to hazardous chemicals. When employees from a temporary agency are working at a site where hazardous chemicals are being used, the responsibility for training is shared by the staffing agency and the host employer. In order to ensure that employers have complied with all requirements of the HCS, contracts between staffing agencies and host employers should be examined to determine if they set out the training responsibilities of both parties. Staffing agencies must, at a minimum, provide generic training to their employees on the requirements of the HCS applicable to different occupational settings and have a duty to inquire and verify that the host, in turn, has adequately fulfilled its shared training responsibilities for assigned employees. The host employer (the company using temporary workers) holds the primary responsibility for training since it uses or produces chemicals, creates and controls the hazards, and is therefore best suited to inform employees of the chemical hazards specific to the workplace environment through site-specific training. This duty includes identifying and communicating worksite-specific hazards and providing appropriate protective equipment to temporary workers. The HCS training provided to temp workers should be identical or equivalent to that given to the host's own employees performing the same or similar work. Bring it all together with laboratory lattice frames and connectors from Safety Emporium. Training programs must be evaluated through program review and interviews with management and employees. The CSHO [Compliance Safety and Health Officer] must interview employees to determine if they have an adequate understanding of workplace chemical hazards. It cannot be expected that employees will recall all information provided in the training and be able to repeat it. Employees must be aware of the hazards to which they are exposed to, know how to obtain and use information on labels and SDSs, and know and follow work practices, including use of any protective measures referenced on SDSs and labels. If the CSHO [Compliance Safety and Health Officer] detects a trend in employee responses that indicates training is not being conducted, or is conducted in a cursory fashion that does not meet the intent of the standard, a closer review of the training program and its implementation is necessary. Paragraph (h) requires that information and training be provided to employees regarding the hazards of all chemicals in their work areas, including by-products and hazardous chemicals introduced by another employer, provided that they are known to be present in such a manner that employees may be exposed under normal conditions of use or in a foreseeable emergency. Is a training program in place? Have workers been trained prior to initial assignment? Have workers been trained when a new hazard is introduced? Do workers understand the workplace (in-house) labeling system? During the interviews, the CSHO [Compliance Safety and Health Officer] must ensure that an employer who relies on alternative labeling under (f)(6)(ii) has provided a level of employee awareness through training which equals or exceeds that which would have been achieved had the employer used labels containing all the information from the shipped container. The CSHO [Compliance Safety and Health Officer] shall evaluate the effectiveness of any alternative labeling method by determining whether employees can correlate the visual warning on in-plant containers with the applicable chemical and its appropriate hazard warnings. Also, a determination should be made whether training been provided on emergency procedures. Paragraph (h)(3)(iii) requires training of employees on (among other things) the measures employees can take to protect themselves from hazards, including emergencies. See section XI.B for a discussion of the interaction of 1910.1200 and 1910.120, Hazardous Waste Operations and Emergency Response. 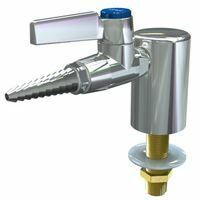 Get your pure water valves and faucets from Safety Emporium. Who controls the manner and means by which work is accomplished? Who supervises the employee on a day to day basis and evaluates the work quality? What is the nature and location of the work? Who provides required instruments, tools, and equipment? What is the history and duration of the relationship between the parties? To what extent can the client/host employer choose a particular worker? Who has the right to assign new projects to the worker? What is the extent of the party's control over when and how long the employee works? Who provides payment and method of payment? Who provides non-salary benefits, if any? Who determines whether a worker gets a raise/bonus? Citations for training violations shall generally be issued as serious unless otherwise noted. If the employer did not provide training that covered detection of hazardous chemicals, physical and health hazards of the chemicals, how employees should protect themselves, and the details of the hazard communication program, a citation for the appropriate subsection of paragraphs (h)(3)(i) through (h)(3)(iv) shall be issued. The citations for the subsections of (h)(3) shall be grouped. The chemical manufacturer or importer may withhold the chemical identity and percentage of the substance in a mixture as a trade secret. If the chemical manufacturer or importer withholds the identity or exact composition of any constituent, the SDS must indicate in Section 3 that the constituent(s) and/or exact percentage(s) are being withheld as trade secrets. Otherwise the SDS is out of compliance. When withholding the percentage of the substance as a trade secret, the manufacturer or importer may disclose a percent range in section 3 of the SDS. If the manufacturer or importer is issuing SDSs, trade secret violations will be under the new standard. Despite the claim that a hazardous chemical, or a constituent thereof, is a trade secret, the PEL, TLV®, or other designated exposure limit must be included on the SDS. Even when a chemical's identity or exact concentration is rightfully withheld as a trade secret, its release may be required by the trade secret access provisions in paragraph (i). State laws do not preempt the trade secret disclosure requirements of the HCS. OSHA requires the responsible party for the SDS to use the words "trade secret" when withholding constituent(s) as trade secrets. The use of other language is not in compliance with (i)(1)(iii). If a question concerning the validity of the trade secret occurs, the Area Office should discuss the issue with the Regional Hazard Communication Coordinator. The Regional Hazard Communication Coordinator shall contact the National Office, if necessary. During non-emergency situations, health professionals are entitled to trade secret information when providing medical or other occupational health services to exposed employees. Employees and their designated representatives are also entitled to trade secret information. If these individuals are denied access to trade secret information, the matter must be referred to the appropriate Area Office for enforcement proceedings. As stipulated in the standard, the Area Office should receive from the referring health professional, employee, or designated representative a copy of the written request for the trade secret information, as well as a copy of the written denial provided by the holder of the trade secret. These two written documents will be reviewed by the Area Director to determine the validity of the request and the trade secret claim. The Regional Solicitor should be consulted to provide assistance in this regard. If the manufacturer does not respond to the referring health professional, employee, or designated representative in writing in a timely fashion, the requestor should document this and provide this information when referring the situation to the Area Office. If the Area Director does not believe that there is enough information upon which to base a decision, he/she may contact either the trade secret requester or the trade secret holder for further information. Such requests will be documented in the case file. 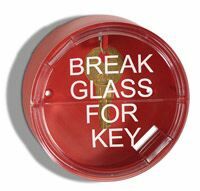 Get your Break glass keyboxes and other emergency accessories from Safety Emporium. The HCS permits a treating physician or nurse to designate that a medical emergency exists, requiring the immediate disclosure of trade secrets. Due to the potential risk to life and/or health, the Area Director shall ensure that these referrals are processed as soon as received. The Area Director or his/her designee will contact the manufacturer of the chemical by telephone. The manufacturer will be informed of the standard's requirements and requested to immediately provide the needed information directly to the treating physician or nurse. The designation of an incident as a medical emergency is left to the discretion of the treating physician or nurse; the manufacturer may not challenge the medical provider's decision in that regard. CSHOs [Compliance Safety and Health Officers] may request disclosure of trade secret identities and exact concentrations under paragraph (i)(12) of the HCS. The manufacturer, importer or employer withholding the information must disclose the information to the CSHO, as required by (i)(12). OSHA shall take all steps feasible to protect trade secret identities, including secure filing and return of information or the destruction of trade secret information when its use is completed. Citations for trade secret violations shall generally be issued as serious citations unless otherwise noted. In response to non-emergencies, where OSHA believes that the chemical manufacturer, importer or employer cannot support the trade secret claim, the withholding of a specific chemical identity or exact percentage concentration shall be cited as a violation of paragraph (g)(2)(i) or (g)(2)(iii), respectively. Where OSHA does not question the claim that a specific chemical identity or exact percentage concentration is a trade secret, but the employer has failed to comply with paragraph (i)(1)(i), (ii), (iii) or (iv), such failure shall be cited. For example, the employer claims a trade secret exists but failed to indicate on the SDS that the specific chemical was being withheld for that reason, as required under paragraph (i)(1)(iii). For medical emergencies, failure to disclose the information shall result in the issuance of a willful citation to the manufacturer, or importer, if the elements of a willful citation can be established. See the FOM Chapter 4, section V.
In many cases the medical facility that is seeking the information will be located in a different jurisdiction than the chemical manufacturer or importer. In this case the local Area Office contacted by the medical facility will refer the issue and provide all necessary information to the Area Office that has jurisdiction over the manufacturer or importer. The Area Office with jurisdiction over the manufacturer/importer will coordinate obtaining an administrative subpoena ordering the immediate disclosure of the needed information. Federal Court orders shall be sought immediately if the administrative subpoena is not effective in obtaining the information. Transition Period, May 26, 2012 - June 1, 2016. 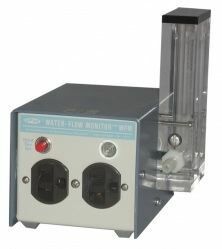 Mitigate hazards in the lab with temperature, voltage, and flow controllers from Safety Emporium. Employers are required to comply with either HCS 1994 or HCS 2012 or both during the transition (or implementation) period. If the manufacturer or importer issues a HCS 1994 MSDS or label it cannot use the hazard classification criteria approach (HCS 2012), but must follow the hazard determination criteria using the requirements laid out in HCS 1994. A manufacturer or importer may not make a hazard determination under HCS 1994 and use it as a basis for an SDS or HCS 2012- compliant label. The manufacturer may not avoid fully classifying the hazards of the product by claiming it is complying with both standards (e.g., classifying toluene as a flammable liquid and putting this information on the SDS and label but not including the target organ information on the label and SDS). The manufacturer or importer may not partially implement the revised standard for a label or SDS for an individual product (e.g., not include all the required precautionary statements on the revised label, or not including all the required information on the SDS. The labels and MSDSs/SDSs must fully comply with either HCS 1994 or HCS 2012. Violations shall be issued under both HCS 1994 and 2012. During the transition period it is acceptable to have HCS 1994 labels and HCS 2012 SDSs or vice versa. However, SDSs and HCS 2012 labels must have the information from the hazard classifications, whereas MSDSs and HCS 1994 labels must have the information from hazard determinations. If a CSHO [Compliance Safety and Health Officer] finds a violation of either HCS 1994 or 2012, citations shall be issued for both HCS 1994 and HCS 2012. Distributors shall not be cited for providing downstream customers with MSDSs during the implementation period unless the manufacturer or importer has already provided the distributor with SDSs. Paragraph (j) is not a citable paragraph. On or After May 25, 2012. OSHA's stay of enforcement on updating labels under (f)(11) of HCS 1994 was removed by the final rule. The (f)(11) provision became effective 60 days after the promulgation of the final rule (March 26, 2012). All manufacturers, importers and distributors who are the responsible party for the product must update their labels within six months of becoming aware of new information, whether following HCS 1994 or HCS 2012. No other effective date was specified for the trade secret provisions of the standard. Therefore, these provisions were effective May 25, 2012. On or After December 1, 2013. All training violations shall be issued under HCS 2012. On or After June 1, 2015. Manufacturers and importers must be using the hazard classifications outlined in Appendices A and B of the standard. Manufacturers, importers and distributors must ship HCS 2012- compliant SDSs. Manufacturers and importers are required to ship only containers with labels compliant with HCS 2012. When a manufacturer or importer is relying on hazardous chemical information from an upstream manufacturer or importer supplier to complete their own SDS development for their downstream customers, CSHOs [Compliance Safety and Health Officers] shall evaluate, on a case-by-case basis, the due diligence and good faith efforts to obtain the SDS information for the ingredients. See Section X.F.2.h for further guidance. On or After December 1, 2015. Distributors must ship containers that are labeled compliant with HCS 2012. A CSHO [Compliance Safety and Health Officer] will determine on a case-by-case basis, whether a distributor exercised reasonable diligence and good faith to comply with the December 1, 2015 effective date. In making such determination, a CSHO shall consider whether the distributor is able to document its communication with the manufacturer or importer about the circumstances for the noncompliance with HCS 2012. See Section X.F.2.h for further guidance. On or After June 1, 2016. Employers must update any alternative workplace labeling for changes related to HCS 2012, their HCS program required by (h)(1), and provide any additional employee training in accordance with (h)(3) for newly identified physical or health hazards. For workplace labeling, in most cases, if the workplace labeling is HCS 1994-compliant, no changes will be necessary. The employer may maintain shipped containers with HCS 1994- compliant labels. However, the employer must ensure that employees understand the differences between the HCS 1994- compliant labels and HCS 2012-compliant labels, and the lack of pictograms, signal words, etc., does not mean the chemical may not present the same hazards. Paragraph (h)(1) requires employees to be trained on new chemical hazards introduced into an employee's work area. Paragraph (h)(3) includes required training on labels received by the employer on shipped containers and on the employer's workplace labeling system. The (j)(2)(ii) effective date allows for an extra 6 months from the deadline for distributors to ship containers that are labeled compliant with HCS 2012. This extra time allows the employer to review all the new information it receives as a result of the revisions and provide new training if necessary. See Appendix E of this Instruction for a quick reference table on the effective dates, explained in detail above. Interface with Other OSHA Standards. In some cases, an employer's duties under other OSHA standards dovetail with requirements of the HCS, resulting in simplified compliance (e.g., 1910.1026, Chromium VI). In some cases, substance-specific standards have more requirements than the HCS (e.g., specific label requirements under 1910.1001, Asbestos). In those cases the CSHO [Compliance Safety and Health Officer] needs to ensure that the employer is complying with the more stringent requirements. Appendix I of this Instruction includes a list of the OSHA standards that have been affected by the update to the HCS. Hazardous Waste Operations and Emergency Response (HAZWOPER), 29 CFR 1910.120. Get your hazardous waste labels from Safety Emporium. Hazardous waste, as defined under the Solid Waste Disposal Act, 21 U.S.C. 6901 et seq, when subject to regulations issued by the Environmental Protection Agency (EPA) under that Act, is not covered by the HCS, as per (b)(6)(i). If the hazardous waste is not regulated by the EPA, then the requirements of the HCS apply. Hazardous substances, as defined under CERCLA, which are the focus of remedial or removal action being conducted under CERLCA in accordance with the EPA regulations, are not covered by the HCS, as per (b)(6)(ii). Chemicals (other than hazardous waste and hazardous substances, as discussed above) brought onto hazardous waste sites are covered by the HCS. HAZWOPER does not cover response to incidental spills that do not have the potential for becoming an emergency. Training for responding to such incidental spills would be under the HCS and would include, at a minimum, leak and spill cleanup procedures and the use of appropriate personal protective equipment (PPE). HAZWOPER has training requirements for emergency procedures, as does the HCS. The scope and extent of employee training regarding emergency procedures will depend upon the employer's emergency response plan. If the employer merely intends to evacuate the work area, the training in emergency procedures could be limited to, for example, information on the emergency alarm system in use at the worksite, evacuation routes, and reporting areas. Employees that are required to respond to spills that have the potential for becoming an emergency are covered by the provisions of 1910.120(q). (See definition of emergency response in 1910.120(a)(3).) Therefore, in workplaces where there is a potential for emergencies, the employer's HCS training program would have to address the HAZWOPER emergency response plan and/or emergency action plan. Training under the HCS can be adapted to encompass all of the required training competencies in 29 CFR 1910.120(q)(6)(i), the first responder awareness level, and a single training could be fashioned to satisfy the requirements of both standards. Access to Employee Exposure and Medical Records, 29 CFR 1910.1020. 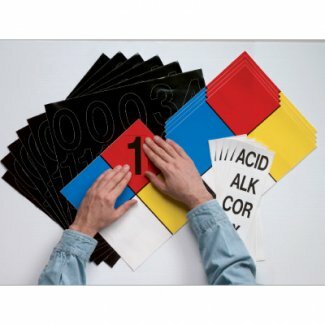 "Material safety data sheets and paragraph (c)(5)(iv) records concerning the identity of a substance or agent need not be retained for any specified period as long as some record of the identity (chemical name, if known) of the substance or agent, where it was used, and when it was used is retained for at least thirty (30) years." Although MSDSs have been replaced by SDSs in HCS 2012, the applicability of this provision in the Access standard is not changed. Therefore, any reference to MSDSs is interpreted to also apply to SDSs. Paragraph (e)(4) of the HCS requires employers to make the written hazard communication program available upon request to employees, their representatives, OSHA or NIOSH, in accordance with the requirements at 29 CFR 1910.1020(e). Section (e) of 29 CFR 1910.1020, requires the employer to provide a copy of the requested record (in this case, a copy of the written hazard communication program) "in a reasonable time...but in no event later than fifteen (15) days...." This means although the hazard communication program must be available at all times for employee access, the employer has up to 15 days to copy the program and provide it to the employee or employee representative who requests a copy. Occupational Exposure to Hazardous Chemicals in Laboratories, 29 CFR 1910.1450. When evaluating a laboratory, the type of laboratory (e.g., research, quality control) needs to be determined. The definitions of a "laboratory" are different in the HCS and the "Laboratory" standard, 29 CFR 1910.1450. Laboratory Standard (29 CFR 1910.1450) Coverage. The Laboratory standard covers only laboratories meeting the criteria of "laboratory use" and "laboratory scale" and excludes procedures that are part of a production process. See 29 CFR 1910.1450, Definitions. In most cases, research laboratories are covered under the Laboratory standard. However, if the research laboratory is also shipping chemicals, it must provide labels and safety data sheets in accordance with the HCS. In most cases, quality control and production laboratories are not covered under 29 CFR 1910.1450 but are considered laboratories under the HCS and will be covered by paragraph (b)(3) of the HCS. The only updates to the Laboratory standard due to HCS 2012 are to the definitions section. Some definitions have been changed to align with the HCS 2012 definitions, e.g., health hazard definition. The HCS covers manufacturerd of chemical specialty products. Some manufacturers of chemical specialty products have incorrectly interpreted the laboratory provisions at 1910.1200(b)(3) as exempting them from coverage. OSHA considers these operations to be manufacturing processes, and, therefore, they must comply with all the requirements of the HCS. A pilot plant operation is considered to be a manufacturing operation and is covered under the HCS. Establishments such as dental, photo finishing, and optical laboratories are not considered laboratory operations for the purposes of the Laboratory standard since they are engaged in the production of a finished product. Employers must comply with the hazard communication requirements of substance-specific standards. Most substance-specific standards have specified requirements for labeling. For example, the Ethylene Oxide (EtO) standard, 29 CFR 1910.1047, provides a different labeling requirement than the HCS. Employers are required to affix labels to containers of EtO in the workplace whose contents are capable of producing employee exposure at or above the action level or whose contents may reasonably be foreseen to cause employee exposure above the excursion limit for EtO (see paragraph 1910.1047(j)(2)(ii)(A)). State that physical and health hazard information is readily available from the employer and from safety data sheets. See the Federal Register notice for HCS 2012 for more specific changes to other substance-specific standards. Use of the HCS to Support a Violation of the General Duty Clause. In the preamble, 77 Fed. Reg. 17574, 17584 (Mar. 26, 2012), OSHA explained this HCS revision will "enable employers and employees to increase their recognition and knowledge of chemical hazards and take measures that will reduce the number and severity of chemical-related injuries and illnesses." The information on the SDS is particularly valuable for chemicals with no OSHA PEL because it may be used by employers to help comply with their general duty under § 5(a)(1) of the OSH Act to protect workers from serious, recognized hazards. This includes protecting workers from overexposures to hazardous chemicals with no OSHA PEL. However, not all chemicals for which employers receive an SDS will necessarily present a hazard in every workplace. Employers should consider the information in the SDS along with their knowledge of actual conditions in their workplaces to determine whether they must take additional steps to protect employees. Other standards that must be considered prior to using the General Duty Clause are outlined in Appendix K of this Instruction and the FOM. Hazard information must be listed in sections 2, 8, 10, and 11 of the SDS. The same hazard information was also required by previous versions of the HCS, but its location on the MSDS was not standardized. Section 10 must identify the chemical's stability and reactivity properties. Section 11 must describe the chemical's toxicological information. Employers are required under 1910.1200(g)(1) to have an SDS in the workplace for each hazardous chemical they use, and to use the information in those sheets when they train their employees about the hazards of the chemicals to which they are exposed under 1910.1200(h)(3)(iv). If an employer has taken these required steps, and if the SDS accurately describes the chemical's hazards, the employer will have actual recognition of the hazard. CSHOs [Compliance Safety and Health Officers] should document who should have received or received the SDS. An SDS may also help show that the employer's industry recognizes the hazard, particularly if the chemical in question is widely used in the industry. The SDS description of the nature and seriousness of the hazard(s) presented to workers may be relevant to determining whether the hazard could cause death or serious physical harm. Section 11 of the SDS must describe the toxicological effects of the chemical, including likely routes of exposure and symptoms of overexposure related to the chemical's toxicological characteristics. As noted above, employers need to consider this evidence in conjunction with other available information, including information about how workers are actually exposed to the chemicals, to determine the extent of protection they must provide. Feasible means exist to eliminate or materially reduce the hazard. Section 8 of the SDS must set forth appropriate measures to protect employees from overexposures, including engineering controls, and personal protective clothing and equipment. CSHO [Compliance Safety and Health Officer] should document the feasibility of abatement for the specific workplace. In summary, where there is potential hazardous exposure to a chemical with no PEL, CSHOs [Compliance Safety and Health Officers] should consider issuing a Section 5(a)(1) citation in accordance with the above guidance and the FOM, by taking into account information in the chemical's SDS. 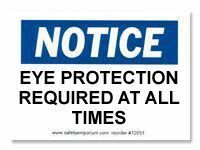 Mark the location of your eyewashes with signs and floor markers from Safety Emporium. The effective dates for implementing the changes to other OSHA standards altered by the HCS 2012 revision are specified in each standard; refer to the individual standards to determine the appropriate dates. For standards where the change affected the warning signs, listed in Appendix J of this Instruction, the effective date is June 1, 2016. For expanded health standards where HCS 2012 affected the chemical labels, the effective date is June 1, 2015. Any change that does not have a specified effective date (e.g., definition changes) was effective as of May 25, 2012. Entry last updated: Saturday, July 30, 2016. This hypermarked and content-enhanced page is copyright 2001-2019 by ILPI, all rights reserved. Unauthorized duplication or posting on other web sites is expressly prohibited. For questions, comments and concerns, please contact us at our MSDS email address.